Il Best Western Plus Caldwell Inn & Suites è situato nel centro di Caldwell. L'hotel è vicino alle principali attrazioni turistiche. Approfittate tutto l'anno del miglior prezzo garantito e di offerte esclusive. La sede del rodeo notturno di Caldwell e il College of Idaho si trovano a meno di un chilometro e mezzo circa di distanza, ed è per questo che diversi nostri ospiti scelgono di soggiornare presso il nostro hotel di Caldwell. Se sei in città per uno degli eventi eccitanti che si tengono al Caldwell Event Center o presso la zona fieristica e dei rodei di Canyon County, a meno di un chilometro e mezzo circa da qui, o per visitare il campus dell'università, la posizione è fondamentale. Gli ospiti del nostro hotel di Caldwell possono raggiungere con un breve viaggio in auto la regione vinicola del fiume Snake e l'Idaho Center, dove si svolge il rodeo Snake River Stampede. 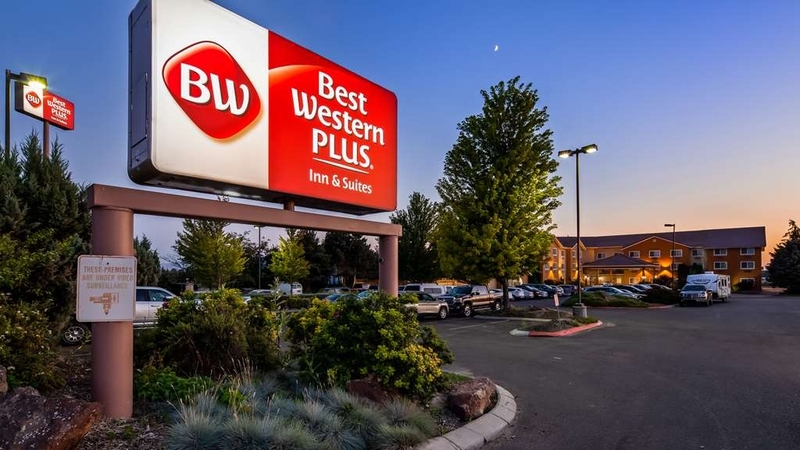 Accogliamo gli ospiti del Best Western Plus® Caldwell Inn & Suites con un caloroso benvenuto e camere spaziose e arredate con gusto. Oltre alla posizione eccellente, offriamo piscina riscaldata e idromassaggio al coperto disponibili 24 ore su 24: il modo migliore per rilassarsi. Un minimarket all'interno dell'hotel vende articoli di prima necessità. Serviamo una colazione completa gratuita per consentire agli ospiti di iniziare al meglio la giornata. Lascia che siamo noi ad occuparci del pasto più importante della giornata e preparati a gustare crostini con sugo di carne, pancetta, waffle caldi e uova, pasticcini, frutta e un'ampia scelta di cereali. Potrai accompagnare il tutto con caffè 100% qualità arabica e succhi di frutta freddi. Disponiamo di un grande patio all'aperto con barbecue a disposizione degli ospiti. I viaggiatori d'affari apprezzano i piccoli confort di casa offerti dal nostro hotel di Caldwell. Alcuni dei nostri clienti aziendali più assidui si trovano qui per lavorare presso Simplot, Darigold®, D&B Supply o Treasure Valley Livestock Sale. Siamo a soli16 chilometri circa dall'Idaho Center e dal Nampa Park, e ad alcuni chilometri circa dal centro commerciale Treasure Valley e dal cinema Edwards. Che tu ti trovi qui per affari o per svago, potrai spostarti in tutta comodità grazie alla nostra ottima posizione. Il nostro hotel di Caldwell è perfetto per coloro che cercano servizi di qualità a tariffe convenienti. Offriamo personale cordiale, deliziosa colazione gratuita e facile accesso al meglio che può offrire la zona, dai rodei alle accademie: se la comodità è una priorità assoluta per te, lo è anche per noi. Prenota il tuo prossimo soggiorno al Best Western Plus Caldwell Inn & Suites per un servizio di qualità! Overall an excellent hotel to stay at. The price for what you receive makes your stay an excellent value. The staff is willing to work with you if there are problems and there were rarely problems during my stay. It is a very pet friendly hotel and the staff like to have your pets there. "Smoke odor in almost every room"
This hotel had a smoke odor problem. It seemed to attract guests with pets and guests that smoked. To get inside the hotel with our grandchildren in tow we had to walk through people standing outside smoking. Everytime. The smoke seemed to be in the ventilation system because even when they moved my daughter and her family to a new room you could still smell it. One good thing was the breakfast was tasty and the pool was quite nice. My first venture to Idaho and the Caldwell area, found a Best Western and knew this part of my trip would be without event. The location was great, the room very comfortable and my other travelers were made to feel at home. - will be back again. My husband and I stayed overnight while traveling to SW Washington state. We were pulling our new travel trailer and had to park in an empty field with the big rigs. It probably would have been okay except for the fact that it was raining and the lot was a mucky, sloppy nightmare! The room itself was small but efficient and served our needs well. It was nice to have a table and chairs in the room! The breakfast was the regular hotel fare of scrambled eggs, roasted taters, sausage links, biscuits and gravy, oatmeal, fruits, yogurt, etc. The eggs and taters were actually quite tasty but the biscuits and gravy was awful! I took one bite and set them aside for the trash. Flavorless, runny gravy on dried out biscuits. I do believe they were the worst biscuits and gravy I have ever had! Pretty nice place, would stay here again. The staff was swapping out mattresses for the rooms which will be a great addition, our room had 1 new and 1 old, slept on both what a difference. The kids enjoyed the pool, it was too cold for me. We always stay here on our way to visit family and have never had a problem. Sometimes we have family come to the hotel to have pizza on the patio and swim . I feel safe and the staff has always been friendly and helpful. Great hotel, clean, friendly and helpful staff. Breakfast was really good. Highly recommend. Room was clean and smelled really nice. 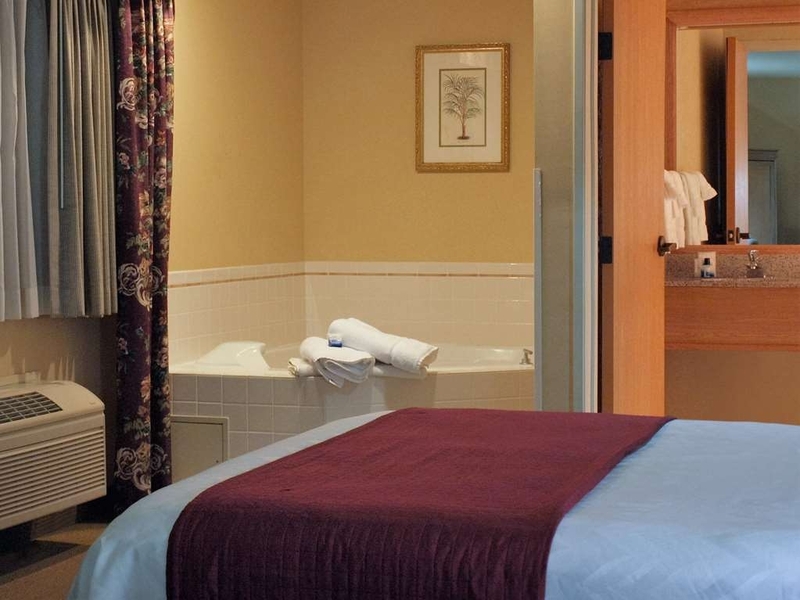 Bathroom was clean, and staff was really friendly and helpful. Would definitely stay here again when in the area. I've stayed in many best western hotels because of my traveling so I decided to stay here for a family event we had going on. I stayed for 6 nights and it was a decent stay. The room was on the third floor and had a strange smell to it, like an old smell even with all the air fresheners they had in the hall ways. One night they left the window to the hallway open because of this, it was in the low 30s that night. They were changing out beds on the first and second floors during our stay so that made for extra noise in the mornings. The breakfast was decent, sausage eggs, and potatoes were the main things among cereal, waffles, and fruits. The hotel is close to a lot of things in the area so that's a plus. Try out the coffee spot right in front, it's awesome! I would recommend looking for a room in nampa if you have the option but if not then this hotel will suffice. The pool was extremely cold for an indoor pool so don't recommend that during the winter months. They also Had an ant problem in the room so look out for that. "Great place with good breakfast and lovely interior/exterior." If the pool had been working it would have been a top rating. Need to get it fixed. Too COLD. The patio dining area is really attractive as is the pool so I am eager to visit again and try both. 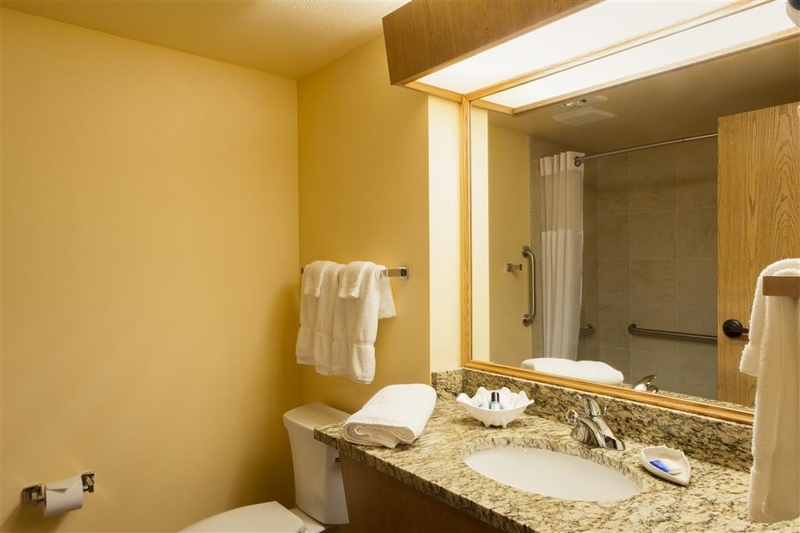 Rooms are very comfortable and I like the idea that the shower/toilet area is separate from the large sink/mirror dressing area. 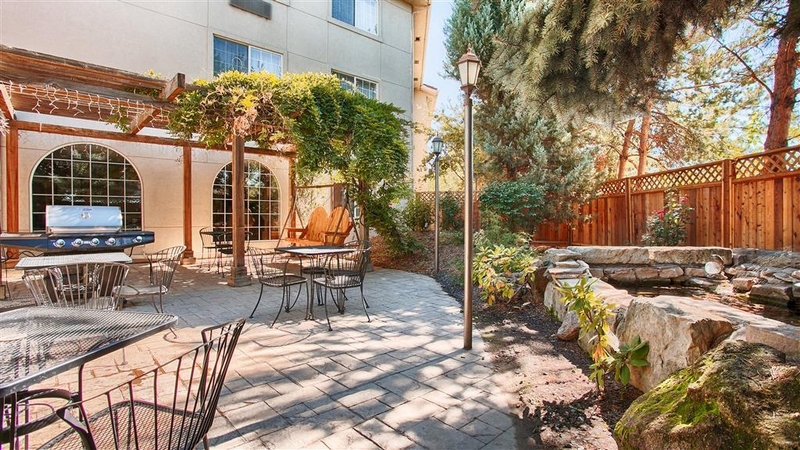 Ample parking and very convenient to College of Idaho. It was a great place to be able to take my grandkids spend the night enjoy the pool. We had a jazzui tub I our room that was very relaxing. My grandkids enjoyed having a hot breakfast they never ran out of food the hotel was busy as it was a snowy night. This is a good place to stay. The staff here is excellent and very helpful. The breakfast is typical hotel style. The rooms are good sized. Our room had a very strong cleaner smell. The carpets need to be replaced. Bed was hard. Overall a decent place to to stay. "Nice new clean Pet Friendly Hotel"
We stayed 2 nights. Staff was very Friendly. Has button automated doors that allows you to easily walk your dog into the building without having to physically hold the door open. Has 24 hour access to swimming pool and hot tub, So remember to bring your swim suit. parking lot, is a little tight, but has plenty of nearby parking for large truck and trailers. For economy minded people. A burger king is located next door. Easy on and off access to freeway. my work has me in Nampa Id on a regular basis, this is the place to stay for location and price. The hotel is nice with large rooms with a desk. The internet is workable for the area. Breakfast is great with lots of variety offered. It's a great location if you don't need to be in Boise proper. Great,Clean, and convenient location for my needs. Very good breakfast and comfortable and safe location. Not to far from downtown area many very good restaurants. On future trips to the area I will stay at this location again. We have stayed here every Christmas Eve for about 4 years now when in town visiting family for the holidays. Facility is well maintained and clean! Room comfortable and Clean! My wife always enjoys breakfast! Also, Christmas Eve Staff went out of their way to make sure we had everything we needed! Highly recommend!!! 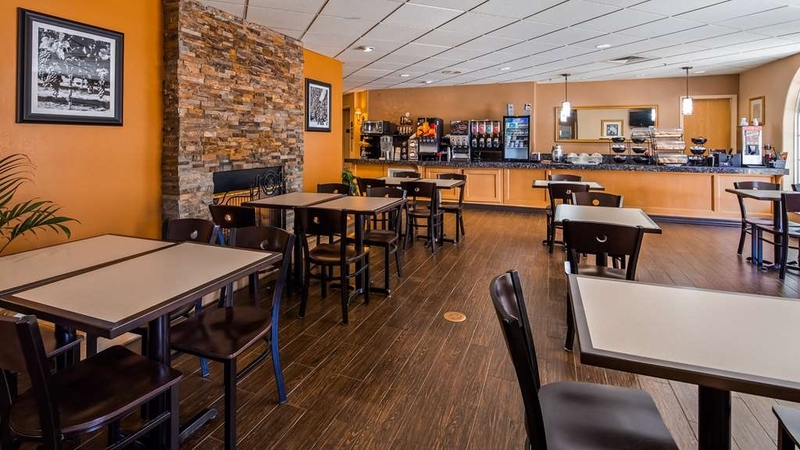 Newly remodeled, affordable hotel with all the amenities and Friendly staff. I needed a room overnight for my wife and I and my grandkids. It was a short visit the pool was great for entertaining my grandkids and we had a newly remodeled king suite! The staff was very helpful. Stayed here on my way to Kansas to see my family. 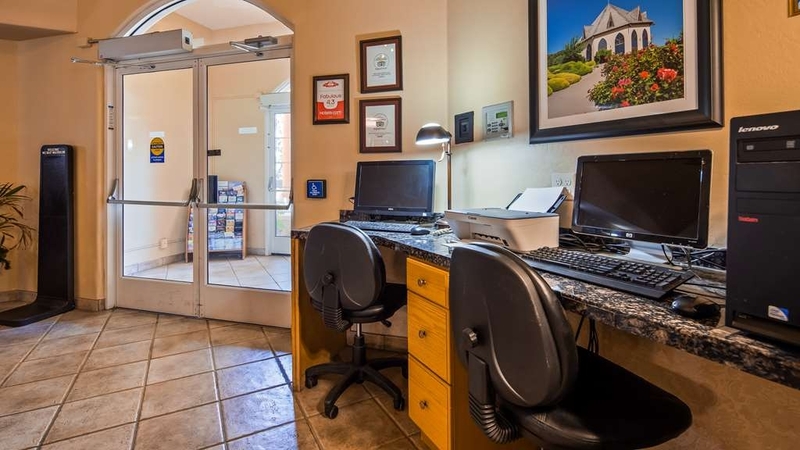 Typically good quality Best Western Inn, well located and well staffed. The room was excellent and convenient since I had my two dogs traveling with me. Hotel was very good. The room was very clean. The front desk staff was very polite and professional. The location was perfect for what I needed.The hotel was very quiet during the night which I appreciated. Awesome Friendly Crew !!!! Made My Family Feel Like Kings and Queens!!!!! Customer Service is Still alive in Caldwell Idaho!!!! From Start to Finish what a great Stay!!! My Kids Loved The Breakfast and the pool was a great hit !!! Motel was Clean and Staff was Amazing !!! The Schroeders will Be Back!!! Thank you, we would love to see you back. Thank you for staying with us, twice. We really do care about you staying and wish you to have a great experience. The housekeeper in question, went and got her supervisor, so that she could approve the room not being cleaned. I am sorry about the mix-up, you are always welcome to just call the desk, and we will take care of everything for you. We also have a housekeeper on duty to about 11 pm, so if something got missed, we would be happy to take care of it for you later. I recently stayed at the Caldwell Inn and Suites. I can't say enough about the staff from the front desk to the breakfast attendant. I arrived unexpectedly one night (10:30pm) earlier than my reservation. Somehow they were able to put me in a room even though everything from Boise to Ontario was filled. I switched rooms the next day and the staff made sure my luggage was safe during the transition. The breakfast had a good selection and items were kept warm. The pool was very warm! When I went to exercise there was no one else around so it was very relaxing. There was a mix-up with the billing, however, It took several attempts to straighten out the charges due to the unexpected arrival and staying in a room reserved for someone else. Even so, the staff was always courteous and willing to fix the confusion. I will certainly choose this hotel again when I visit Caldwell. "Great value for the price! Will stay here again!" Everything looked new and updated. Pleasantly surprised by amenities. Comfortable bed, breakfast was excellent for me and my kids. They were very accommodating with extra blankets. Nice pool and hot tub ( we didn't use) but it was all very appealing and aesthetically pleasing. The motel had great pricing and the location was very close to where we wanted to be near. The staff was very polite and informative. Would highly recommend this to anyone needing to be in the Caldwell area. Very clean. I had absolutely no complaints. The room was clean, the bed was great, the bathroom was clean, the towels were great, the breakfast even had bacon one day. couldn't ask for more, but I need 11 more characters. "We love the Caldwell Inn!" Nice clean rooms. Comfortable beds. Great choices for breakfast. Friendly staff. This hotel is our choice to stay in whenever we are in this area. Our grandchildren love the pool. Quick on and off the freeway. We always use this hotel when traveling to Lewiston, Idaho. We have never had any problems and the staff is always friendly and helpful. The hotel extererior and rooms are always clean and well upkept. "I Cannot Recommend this Hotel"
The good news is that the two people at the front desk, when we checked in, were polite and friendly. The bad news is this is not an attractive area, this hotel seems very old, the small and old elevator smelled, the carpet in many of the common areas looks very worn, the room had an over-whelming odor from the fragrances that they use to try to cover-up other bad odors, and the hot tub was way too chilly! I did not try the breakfast but Hubby said the biscuits were very dry and the eggs over-cooked. Someone should either turn this into a $59 per night hotel or invest a lot of money fixing it up! For the $129 + that I spent for a smelly room, I was definitely ripped off. We are really sorry that your stay with us did not meet expectations. There is not to much we can do about you not liking the area, We are still a small farming community, we still auction livestock, right down the street from the hotel, and perhaps some of the smells that animals bring with them, did not agree with you. We usually do not use smelly stuff to cover up smelly stuff, but people staying with us, often leave rooms smelly with perfume, and hair products, we open the windows and try and get it out, sometimes it is still smelly. Our pool is heated to 87 degrees and the hot tub is kept at 102. We just had the calibrations on the heaters checked to make sure they are running correctly. Some people at home like the hot tub warmer, but we feel in a public setting, we should not exceed 102. We do have suites with private hot tubs in them, those you could chose a higher temperature with. The hotel is about to get all new carpet put in, just waiting for delivery date on it now, we have redone the whole lobby, breakfast area, with all new tile, furniture, lighting and artwork. not much left in the public areas that hasn't been updated in the last year. We are starting the renovations on the guest rooms with all new carpet. The guest rooms right now have all new activity tables and chairs, serta pillow top mattress, and all new lighting in them. This was a one night stopover on our way to see family. 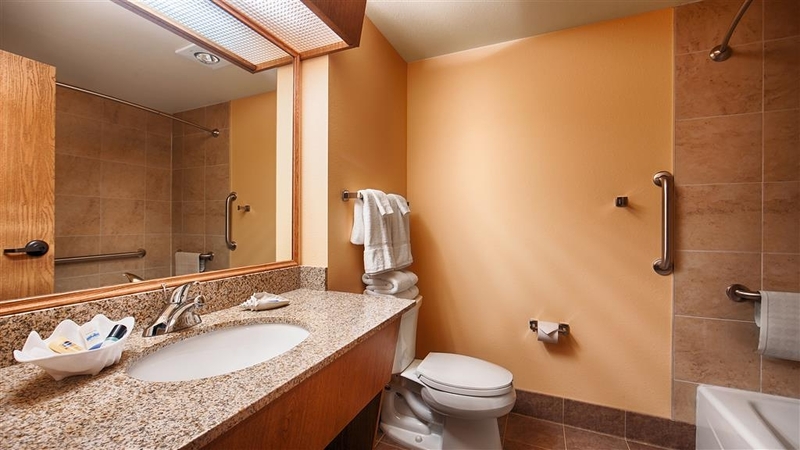 I've always been pleased with Best Western and their professional, friendly customer service, cleanliness, and although not what I would consider luxurious ~ very comfortable rooms. I also appreciate their secure fitness rooms. I've traveled extensively and have seldom had such outstanding service and an enjoyable stay. The room was nice and well maintained and the staff was helpful above and beyond what could even be hoped for. The location just off I-84 and with several restaurants within walking distance (including a Burger King just across the parking lot) was very convenient. And I love how pet friendly they are. Not only would I stay here again but I hope to get to again soon. We were upgraded to a suite which was good. Hotel is a bit dated and could do with a make over. This was our 24th day on the road trip on a motorcycle and being very tired we were looking forward to a relaxing night and a long sleep. Our room was very comfortable, bed was great, pillows even better and a good bathroom and shower. However, our quiet night was not to be. Around 2.40am we were awoken by loud voices and laughter. We thought it was next door, but the night manager informed us that it was the room immediately below us. We couldn't believe it as the noise was so loud. They quietened down after the night manager spoke to them. We eventually got back to sleep with aircon on and earplugs in but it wasn't our good night. Very disappointing. "Great stay just needs updated"
Great experience but needs updated. The hotel is very outdated and even smells old. The breakfast could use some work. But staff is great. Hotel was very clean and the pool was perfect! Great stay!!!! "Best Western is my new go-to place!" I was just looking for a place to stay on a long trip and Best Western was one of the options. The prices were reasonable so I made my reservation. We got in at 2am and we were greeted by friendly hosts and checked in. The room was comfortable and spotless! I was happy to find out breakfast was served a little later than normal, between 7-10am, since we're not really early birds and it was delicious. They pretty much had everything you could want... biscuits and gravy, waffles, eggs, sausage, potatoes, oatmeal, a variety of juices, etc... I was so impressed the first time, I booked it again for the following weekend on our way back home. I highly recommend staying at Best Western. It is now my official go to spot! Hotel staff was great. Service was great. Hotel is could use a little refreshing.When we originally checked in our room had a odor of cigarette smoke. We brought to the attention of the front desk and person running the front desk went above and beyond to get a different room! "Ok Hotel - Muggy Lobby Area"
When we went to check in the lobby was very muggy like they were not running the AC. The rooms also had a weird smell. The room was clean and the bed was. The location is right off the freeway so that was nice. I have definitely stayed at nicer Best Western Hotels. We were on our way from a family emergency in South Dakota and came through Idaho to visit parents and other family on our way back to California. 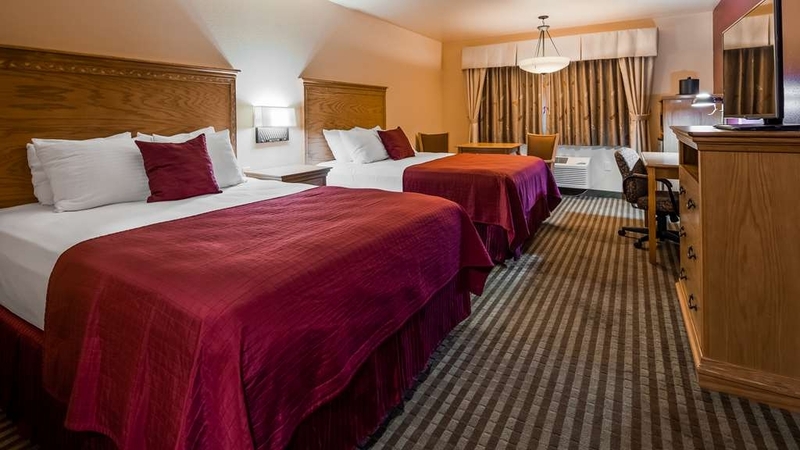 We love to stay at the Caldwell BW Inn & Suites when we visit. We always travel with our dogs and they are welcome and we always feel at home here. "One night stay on a cross country road trip!" Nice stay....right off 84W with a lot of options for food. Front desk staff was very friendly and helpful. Breakfast offered a great selection and appreciated the drink machines were open all night! Pet fee was minimal which is also an added bonus. Not the best location in Caldwell, but otherwise an okay stay. The Best Western is across the street from a truck stop, next to a Burger King and a closed restaurant, with a dusty truck turn around and stock yards upwind. The hotel itself has some nice features, like a small convenience store, a patio with a charcoal barbecue, and another landscaped patio fenced in. The staff were super nice and checked to make sure the room was ready before sending us upstairs to be disappointed. The room itself was dark due to the maroon wall. A/C worked okay, water pressure was good, and we had everything we needed. Scrambled eggs, sausage, and potatoes were available in ample quantities for breakfast. We arrived around midnight and appreciated that the someone was at the front desk when we got there. The elevators were also appreciated. The carpeting in the hall on our floor was a little worn in spots, but the hotel was clean. The beds were comfortable. Breakfast offered a good selection. The location next to the freeway, with gas stations nearby, was convenient. 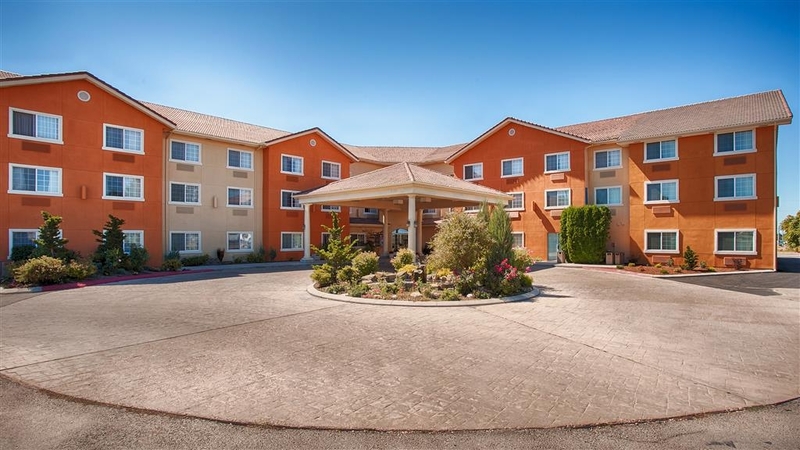 We stayed at Best Western Plus in Caldwell on 6/27. The property is nicely kept, very clean and the room was spacious. Everything was perfect except two weeks prior management changed the start time for breakfast from 6 a.m. to 7 a.m. People who are traveling and getting an early start either for business or long drive can't wait until 7 a.m. to have breakfast. In my opinion this type of change is more for management to save money on wages than it is to provide good service to customers. All paperwork in the room still said breakfast started at 6 a.m. The hotel was easily accessible, the staff was friendly, and the room was spacious. The bed was very comfortable. We only stayed one night, but it was enjoyable. The free breakfast was good. I would recommend this hotel. Stayed overnight here on a cross country road trip. The property is well kept and conveniently located just off of I-84. Counter staff was courteous and helpful. The room was spacious, well appointed, and very clean. The bed was very comfortable and the air conditioning worked very well. The complimentary breakfast was very good and consisted of eggs, bacon, sausage, potatoes, etc. Much better than some hotel breakfasts. Overall, an excellent stop and I would recommend this hotel. This is a very nice place to stay. The staff was great and helpful. The room was clean and the bed was very comfortable. The breakfast was simple but was fairly good. Would have given it a 5/5 but the bathroom is old and needs remodeling and the breakfast bakery items were only average. Would definitely stay here again. Arrived very late in the evening and the front desk attendant was very friendly and provided help finding a spot where I could park my Uhaul trailer for the evening. 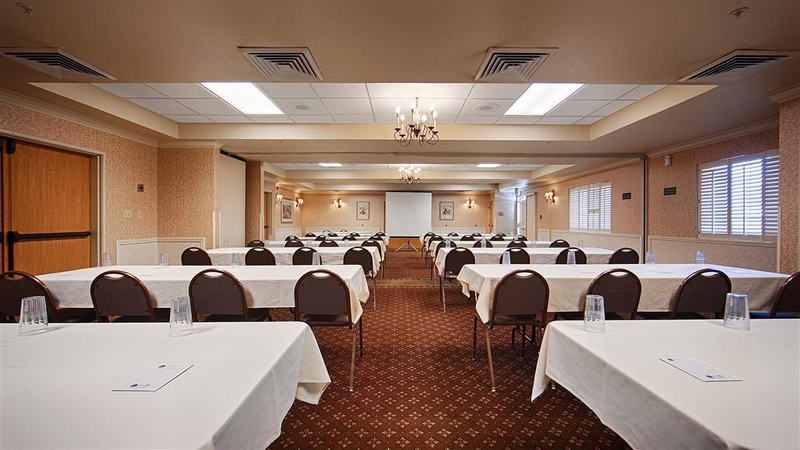 The location is very convenient to the interstate, and the room itself was decent. I remember specifically that the pillows/linens were not great, but for $90 a night, you get what you get. I'd recommend it to travelers passing through the area, as I was, as it is adequate for catching some rest before getting back on the road. I did end up spraining my ankle in the back parking lot while loading up my truck though. There was a manhole cover I didn't see that was about an inch or so below the rest of the payment and I fell pretty hard. I felt pretty dumb, and driving cross country in the middle of a move with a busted ankle was not fun. I'll have to pay better attention next time, but it might be something the owner should look into. One night here, was at the La Quinta across the street which did not work out. Showed up with no reservation and the front desk folks were great. They fixed us up with a nice room for a reasonable rate. $120.00 which included breakfast. We would stay there again when in the Boise area. average, unlike most of my stays at BW properties. desk person upon check-in might have been new and not trained. Breakfast was good and attendant seemed to be on top of keeping presentable and stocked. Our hotel stay was great--we liked the size of the room and the amenities. We opted for a bigger suite and it was very spacious and comfortable. We had our dog with us, and their dog-friendly policy was appreciated. Thanks! My daughters and I were in town for my granddaughter's Senior Recital at The College of Idaho. From arrival to checkout we were treated with respect. The manager (Linda I believe), checked us in. She was professional and friendly all at once. She and the staff I had contact with really seemed to care about the quality and comfort of their guests stay. The beds were comfortable, breakfast was good. It was a nice and quiet stay. Will stay here again! We drove up to ID for my Wife's birthday and to see son. Our son drove down from Moscow so this was a nice half way meeting point. Best Western Caldwell, ID was a nice quite place to stay. They have a very good breakfast in the morning. We stay there when working in the area. Always a comfortable bed, and nice staff. the rooms are clean and quiet. I recommend this to anyone that needs to stay in the Caldwell area. We stay there2 or 3 times a year. 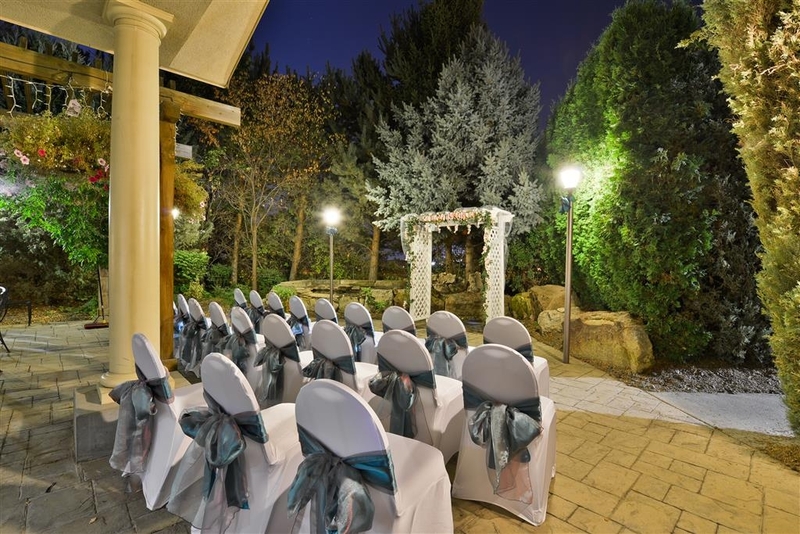 "Great location and awesome pool"
The hotel staff was very friendly and accommodating. The breakfast was yummy. Lots of options. The pool and hot tub were my favorite. The hot tub was actually hot. The rooms were cozy. The bed was hard, could be updated, but over all it was a good night sleep. I stay at a lot of best westerns. They never disappoint. Receptionist new my name when I came to check in, it was awesome and I felt so welcome. When I went to use the pool she handed me a towel as I walked by the front desk. WOW I would definitely recommend this hotel. The room we got was perfect. Clean and bright. Wifi was good. Good choice for breakfast. Not many places to eat within walking distance but there was an excellent one across the highway, a family diner that served large portions. Just didn't appreciate the garbage truck at 5:30 am. 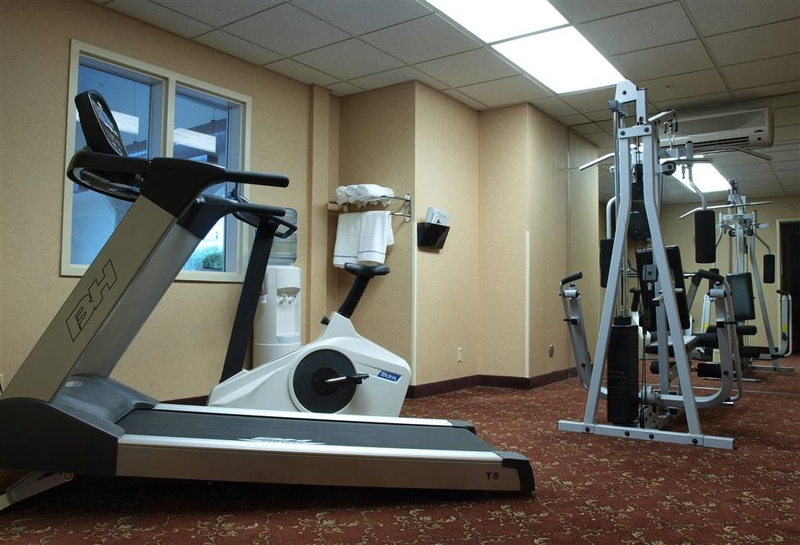 "Great Stay Clean rooms friendly Helpful staff"
Located conveniently just off I-84 in Caldwell. We heard a little traffic noise in our room but not too bad, particularly because we had the heat/air cond fan running continuously. The room was well kept and spacious. The bed was very hard and not to our liking as my wife and I have hip and back issues. Bathroom was clean but not too large. The breakfast was good and pretty typical for a BW. Scrambled eggs, potatoes, sausage, cereals, pastries, fruit, coffee, tea and juices. If you're in a hurry and not looking for fancy, it's fine. The hotel is pet friendly ($5.00 for our dog) but their isn't a blade of grass on the property. Our dog is fussy about where to potty so that was a challenge for us. The staff was very helpful and friendly and I'm sure one of the reasons the hotel was so busy. "Trip to relax and see friends"
Had a very good experience staying at the Best Western in Caldwell Idaho. Very relaxing and comfortable. The location was very easy to get to, close to the freeway and to coffee shop. Staff were excellent, friendly and helpful. "NIce hotel and a better price then surrounding"
The staff was very nice and the hotel was very pretty. The bed was comfy, but the sheets felt really scratchy is why I didn't give a five. Breakfast was standard, nothing fancy, but did the trick. I would stay here again. We would have liked to have a room with a king size bed but due to our short time frame, we were not offered on. During checkout, we found out that the kings are available but they go fast. We will be making reservations earlier the next time. This chain hotel has a small town homey feeling. I picked it solely based on reviews and really did not know if it was close to my destination. I was happy with stay. Check was ok- nothing special but the person was very animated and friendly. Hotel elevator is slow. Room was average but updated and well maintained. Many small touches in the room showed the personal attention. TV was fine, Wifi was free and fast enough. Plenty of electrical in room for charging. I did not like the thru the wall heater. Seemed hard to get temp to maintain. Bathroom was my only complaint. It was updated but the shower room was much too dark for my expectations. I have to return to Caldwell and plan to stay at this place again. The staff was friendly with an easy check-in. The room was clean however the pillows were very hard and lumpy, not a good nights sleep. When we first enteried the room, it overwhelmingly smelled of heavy-duty "air freshner" but we opened the window and the smell soon dissipated..
we have stayed at this hotel 3 times and find it to always meet our need. We always sleep well there. The establishment is clean and the breakfast seems to have something for everyone. the hotel has a pool that is open around the clock so next time we will bring our swimming suits. "They had me at Chobani Greek Yoghurt." You had me at Chobani Greek Yoghurt. ?? I ?? u Best Western. Love the consistency of service, room accommodations, and your continental breakfasts. Another stop during my long winter road tripping vacation and you made my one night stay over wonderful. Special thank you to the front desk person who handed me a tissue when I checked in and my nose decided to have a sneezing marathon. Much appreciated. I know I was totally looking cranky and you were still incredibly nice to me. Really appreciated it. The room was great. Price was just right. Location gets us right back (under a minute) on the freeway to our final destination: Home! Thank you so much for taking the time to write such a nice review for us. I printed it off, so everyone on staff can see how their kindness can make a difference to someone. One of the better Best Western Hotels that we have stayed at. No extra charge for our pet, very good service, a nice larger room, bed was comfortable and room very clean. Breakfast was above average, good selection and service. Would definitely recommend this hotel and will stay here again when traveling through area. The staff was friendly and accomodating, breakfast was better than most hotels, pet fees were way below most hotels. Room was clean and quiet even though they were close to freeway. Would recommend to friends. Our preferred place to stay when visiting the grand kids. Breakfasts are great, and the staff are friendly. Suites are clean. Lobby is pleasantly decorated. Swimming pool is always a comfortable temperature for swimming children. Always enjoy our stay. 2nd year we spent Christmas Eve at the Best Western Caldwell while celebrating the holiday with our families! Staff are welcoming and helpful!! Made sure the hot-tub was warm for when we returned that evening! Breakfast Was Very good and the hostess worked very hard to take care of everyone!! Room clean and comfortable!! This is a well maintained older property but what makes it stand out are the PEOPLE!! We will be back next year!!! "Great Stop Along the Way"
Hotel was very comfortable and clean. My only negative is that the front entrance lacks signage or something as it was hard to tell where to go in to check in, (other than the circular drive). I'd stay again! "This Location, and Linda are awesome!" Linda is amazing at taking care of her customers. She is very kind, caring, and she recognizes me in person and on the phone. This location is very enjoyable. I've stayed here probably 100 times over the past 5 years, and i've NEVER had a bad experience. They truly treat me as part of their family. All of the Best Westerns in the Boise area are a very good value. The King Size beds were new and very comfortable. The Caldwell property had a nice outdoor barbeque area next to the breakfast buffet. The Mountain Home property even has the breakfast at an adjoining restaurant. The staff is very friendly and helpful. The room and facility were great. Everything is clean and well maintained. Easy highway access. 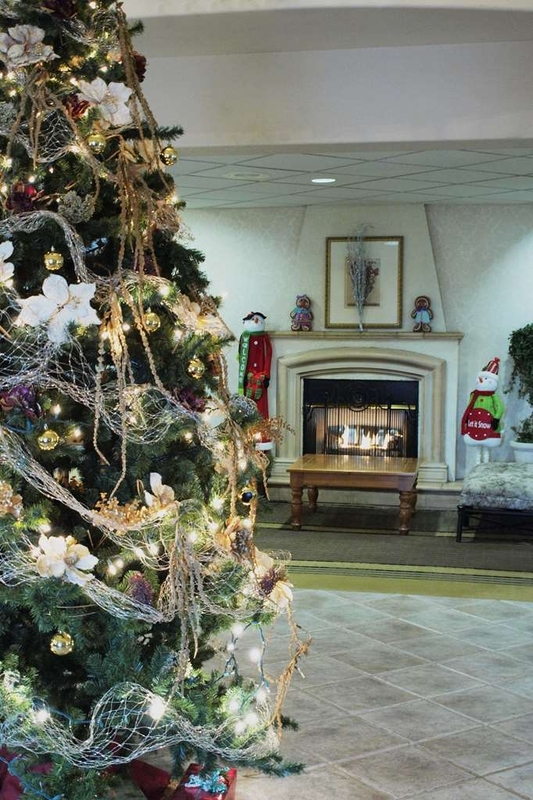 Lobby was decorated for the holidays with a large christmas tree, made me feel at home. Breakfast was great and dining area was clean. We have stayed here many times this motel is usually very quite service is great staff always helpfull the breakfast is always well prepared and hot. one of my criteria on all business includes if I see same employees as this indicates a caring owner. the gal who checked us in was same as 5 or 6 years ago and have seen other clerk at least for couple years. also like the ability to get checkout by email. "Customer Service is IMPORTANT and having equipment in working order makes a difference." Please ask me if I want the points or gift. I have stayed at a Best Western Hotel every month in 2017 and have earned over 60,000 points this year alone. This is the only BW that did not seem genuinely nice or thank me for being a rewards member or ask me to choose. It may seem petty but I didn't stay at these hotels for free. I appreciate good Customer Service. The Fitness Center or should I say "Tiny Room with 1980's equipment" was very disappointing. A HUGE broken treadmill blocked the water cooler and the water cooler had no cups. The 80's machine was missing workout bars/straps and just looked like it wanted to be retired and die. The flat bench doesn't fit (literally). I understand why the pool was closed and I watched the amazing folks from the Caldwell Paramedics and Police do an amazing job trying to save that man's life. Truly HEROES! Did I mention breakfast was Great! Stayed here during a road trip between Washington and Utah. The rooms are a bit dated but clean and comfortable. The desk chair was comfortable to work in and the furnishings comfortable. Super easy on and off the freeway, Burger king and Dutch Brothers Coffee right in the lot with a convenience store right across the street. Large parking lot with large vehicle parking space. 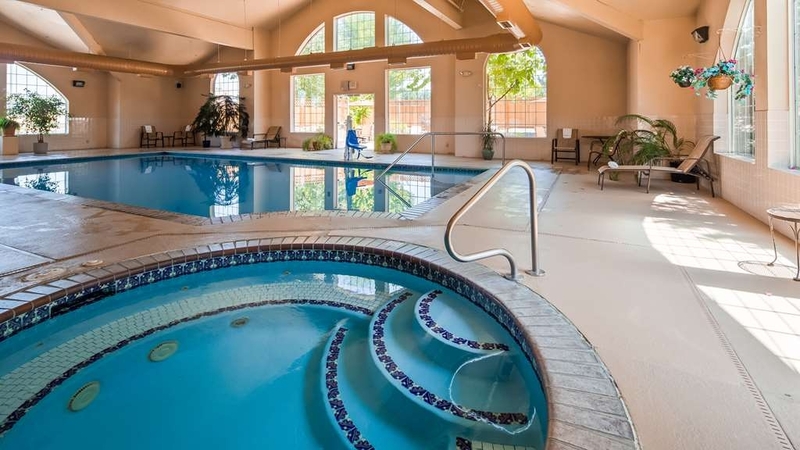 Lynda at check-in was very helpful, indoor pool and Jacuzzi were warm and in good working order. Amazing staff & facility! Original reservation was with La Quinta, they were totally unacceptable, 2- HOUR DELAY AT CHECK-IN. Staff was rude & unprofessional, lobby was filthy! We were there for a medical procedure, because of the delay we couldn't start the medication when we were suppose to. Cancelled & went to the BW. IT WAS WONDERFUL! Learned my lesson! Conveniently situated just off the 84. Stayed two nights as we were in the area for the Solar Eclipse. We had been on the road all day so walked into Caldwell for food as there isn't much around the hotel. Room was ideal with everything we needed, very clean. Staff were all very friendly and pleasant. Breakfast bar was very popular, everyone else must have also got up early for the Eclipse. Buffet was excellent. 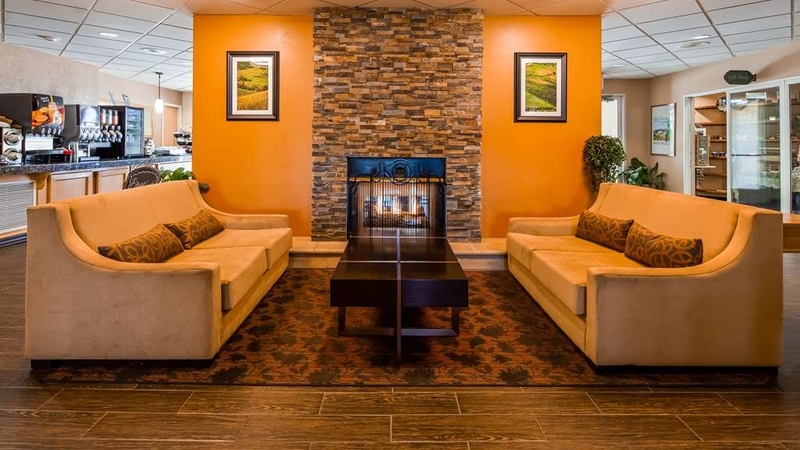 If you're travelling to Caldwell or thru Caldwell I highly recommend stopping at the Caldwell Best Western right off 84 East (3rd Caldwell exit). Linda and her staff will make you feel so welcome, the rooms are very nice, beds comfortable, breakfast better than most, etc. We are COI parents and always get just a regular room. My parents, who travel often, got a suite recently and said it was one of the nicest suites they'd stayed in . . . all in little old Caldwell. We are very happy with our family's experience this past weekend at the Best Western in Caldwell, Idaho. It was a gathering to celebrate a wedding and the staff went out of their way to assist us in that celebration. The food provided was very good and there was an abundance of it. The stay at this hotel is always a great one. I have enjoyed being in a smaller town and away from more of the hustle and bustle you find in bigger cities nearby. This is a great deal and well work the money spent. I mistakenly reserved a room at a Best Western with a similar name in Caldwell Ohio instead of Caldwell, Idaho. The hostess at the front desk was very helpful in getting that reservation cancelled without a penalty and getting us a room at her hotel. The room was very clean. The bed was a bit on the firm side for my taste. They had several different sizes of pillows. They provided a full breakfast, not just cereal and bread. Very good. We will stay again if we're in Caldwell...Idaho. This hotel is an easy on easy off location by the freeway. The desk staff are helpful and friendly--especially Lynda. She remembers us each time we stay. The rooms are spacious and the free breakfast is nice. There are eating places within walking distance. We stayed on a Wednesday and the cost was outragous for what we got. There were tears in the carpet, stains in the carpet, spiders, dead flies in the window screens, dirty windows and the place was very noisy. We would like to thank you for staying with us, and we are sorry that you did not enjoy the time you spent here. BWPlus Caldwell, ID is a hidden gem. Very nice hotel. clean, great breakfast, and the pool/jacuzzi is one of the best of any hotel we've stayed in. The beds are always comfortable in a BW as were these. Great breakfast and the staff were very helpful and personable! I will stay there again when we're traveling in/through the area. The service was excellent and the breakfast was good. However, the beds really need to be replaced - you bottom out - and the rooms could be a little cleaner. Overall the location is great, but the experience is average. This is a very nice BW Plus, just off the freeway, but no traffic noise. Nice rooms, good breakfast, and very friendly/attentive staff. -- Hallways needed better maintained (vacuuming) which did not leave the very best impression, but everything else -- especially our room -- was very clan and well-appointed. We would return again. "8 crappy pillows so I slept on a towel." There were 4 pillows on each bed which were all the same. If you don't like sleeping with your head elevated, you are out of luck. I tried to sleep with no pillow, however the bed is very hard. Finally used a folded towel, for a pillow. Who buys all the same pillows? What a waste of money. We found Best Western to be very accommodating and comfortable --good breakfast and comfy beds and price was fair. Only problem that we had was trying to set the alarm clock and front desk tried to help but it may just have been US. This is one of the most outstanding accommodations we have experienced in our travels. Right off the I-84 freeway in Caldwell, Idaho. The staff is extremely friendly and capable. Their breakfast will long be remembered. "Great hotel with a local feel!" 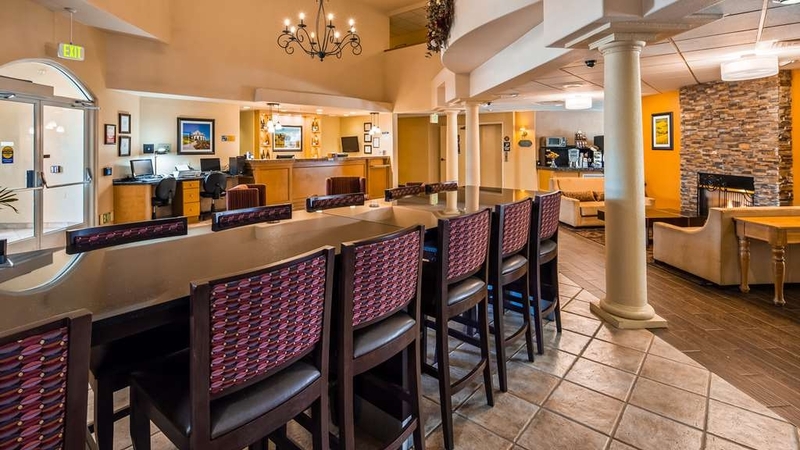 We travel often and this hotel differentiates itself because while it lives up to Best Western standards it has also has an overall feel of local hospitality. From the moment we checked in, Lynda made us feel very welcome and kindly answered all of our questions about the area. The hotel and the rooms are clean and comfortable. Breakfast is nicely presented and there is a good variety including hot options such as eggs, sausage, potatoes and make-your-own waffles. They also offer 24-hour coffee service and the gift shop includes locally made and homemade items. We will definitely stay here again! The best place to stay for a visit to College of Idaho! I was impressed with everything, including the BEST breakfast I've had at a hotel. I really appreciated the fact that everything in the room was in good working condition. I highly recommend this Best Western for cleanliness, comfortable bed and decor. Pleasant, helpful staff and good complimentary breakfast left us wishing that we could spend another night! AND we got a heck of a deal on the cost of the night's stay. We are Best Western members and are usually happy with the accommodations. Not really easy to find off interstate but gps led us astray. Easy checking but parking really scarce. Big trucks took up a lot of space so we dumped off our luggage at front while husband went to find parking, and I stayed with belongings. Room needs a deep clean due to dust, maybe due to the smoky conditions from western forest fires. But we slept ok. Breakfast was the usual chain fare and satisfied. 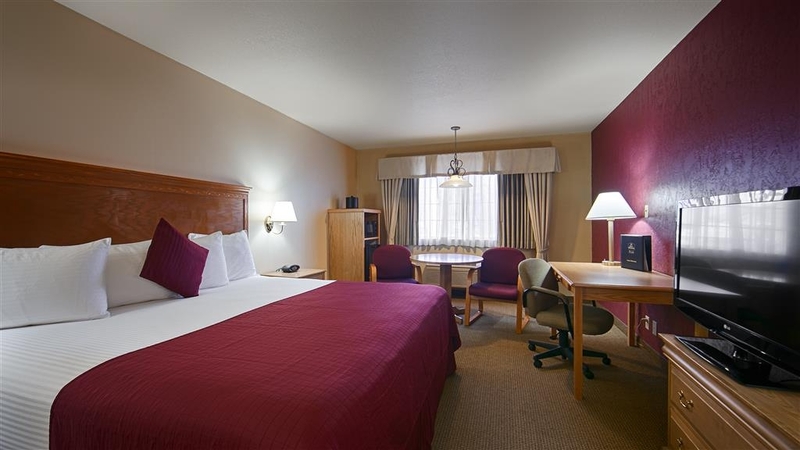 If you're stay for a visit to the College of Idaho, this is a great location and price. Very clean room with a good breakfast. Only about 2 miles from C of I and close to the football stadium. 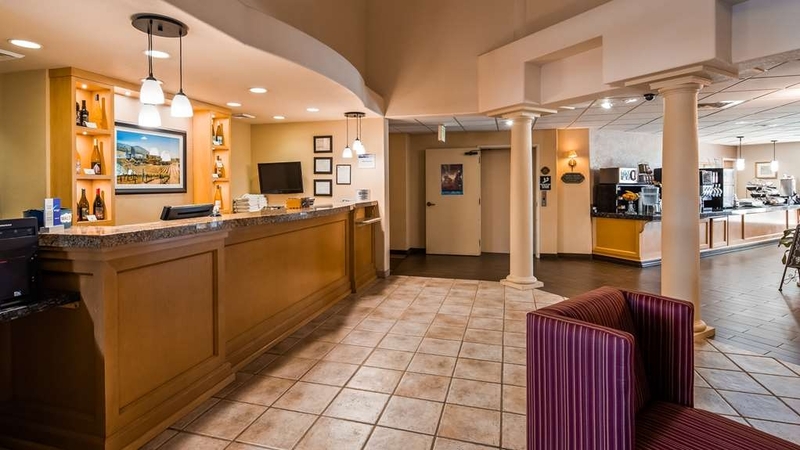 You could stay in Boise and pay A LOT more and I'm not sure if it will as nice as this Best Western. "Except for the internet speed, this is a superior hotel." Higher than usual quality hotel with superior outside landscaping and interior lobby. Appeared to be a nice pool but we didn't use it. Breakfast was also well above average with nice fresh fruit and yogurt. Wifi works but is slow. "24 hour indoor pool for adults." The location was right off the highway. The pool is open 24 hours a day for adults. Several small restaurants near by. There's a truck stop just on the other side of the highway. Great place for a quick fuel up and snacks before continuing your trip to the great Northwest. very good service from employees. Nice looking comfortable rooms. Breakfast is good. They have fresh coffee, scrambled eggs and potatoes. also biscuits and country gravy. They also have a nice small exercise room and indoor swimming pool. Best Western Plus always takes great care of us on our stays! It is our home away from home! Assistant Service Manager Linda goes above and beyond to always make us feel at home! Friendly staff, clean hotel and rooms! This is a very nice place to stay, the wife and I have been here a bunch. Lynda and her staff are top notch and they will make sure you are taken care of. They are usually biker friendly and to me that is a extra added plus in my book. "Nice place to rest your head..."
I've stayed here on several occasions during visits to Caldwell. The staff is very helpful and courteous if you have questions or requests. The housekeeping staff is also very polite and do a nice job. I haven't used the pool or gym here so I can't comment on that part. The breakfast offered in the mornings has a nice assortment of fresh fruits, hot items, cereals, coffee, juice, yogurt, etc. something for everyone. Lack in cleanliness; After a 7 hour car ride we finally make it to BW expecting a decent stay in a CLEAN room... We walk into balls of fur, ants and spider webs with spider eggs in them. Furniture with balls of dust hanging off the edges. After notifying management on she did her best to salvage our stay moved us to room 329 which has experienced severe water damage without any aesthetic repairs made... room was cleaner but the bubbled ceiling and cracking paint made it uncomfortable. Sorry that our hotel did not meet your expectations. You were here on the busiest week of the year for us, and in spite of our staff doing everything possible to make your stay more pleasant, we just did not make it pleasant for you. So again we are sorry, we strive to make our guest happy while they stay with us. I've stayed at this hotel several times now on business trips to Caldwell. It's always clean and they have a better than average breakfast. It's also convenient to I84 and less than a half hour drive to great shopping and dining options at The Village at Meridian. We arrived late to find a comfortable bed for the much needed rest. The breakfast in the morning was delicious. It was the best breakfast that we have had in days. 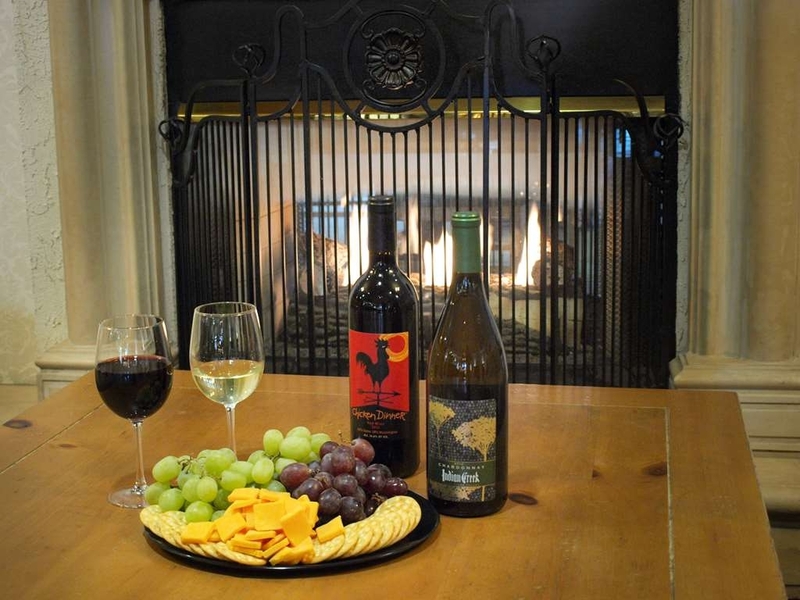 We sat down near the beautiful stone fireplace and enjoyed the ambiance. A Standard Best Western Hotel with the usual amenities. Within walking distance to the Caldwell Football and Rodeo stadium. White noise from the A/C (turn fan on to constant) helps sleep quality. Large rooms with the usual facilities. Room colours and decoration in the common areas are jaded and the lift could do with an upgrade. Buffet breakfast with a small hot offering. Plastic utensils, paper cups,plates and bowels, has no one in this hotel heard of waste recycling as all items (including food waste) go into the same trash can? Surely this waste does not go into landfill? This hotel is one of the best we have ever stayed in. Breakfast is great, there is a restaurant on site. Staff is efficient and very helpful. Price is good. We are staying here for the second time in 2 weeks. Treated us like family when we walked in. "Comfortable but needs some updating"
The room was clean and comfortable but showed wear. There were several stains on the carpet in our room and cracks in the tile. The breakfast was nice but could have more variety. Cooked oatmeal would have been nice instead of the instant variety. Very comfortable with reasonable prices...Excellent staff and management. Worth a look if your passing through the area...You won't be disappointed with your stay. Very convenient location with great parking options. Terrific CLC hotel! 5 Stars! "Best over all service in every area. They are great"
Would have given this hotel 10s straight across, except for the flies in the pool area and a few areas of stained carpet. I never had a better experience in the last 10 years. All of the staff are Great, All of them, Friendly, respectful, experienced, in all that they do. Thank you for staying with us, i have to admit the flies in the pool area, were totally my fault. We repainted the hot tub this week, and it was so hot, and the paint smelt so bad, i propped open the back doors. After we were done and i went to close the doors, the room was full of flies. I am so sorry, i know that several people complained. Next time we repaint it will be in the middle of winter. 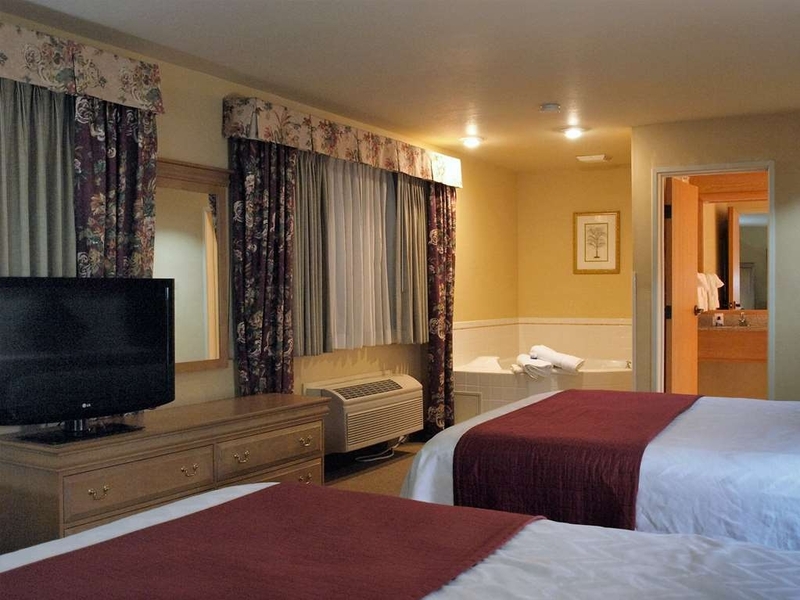 My boyfriend and I always try to stay at Best Western Plus Caldwell Inn & Suites, Caldwell ID. All my kids and 7 grandchildren live in the Nampa/Caldwell area. Only once did we have to stay elsewhere because they were booked solid. The staff here is wonderful, and the hotel is very clean. Their buffet breakfast is great, too! "Trip to Idaho to visit our sister and her husband in Homedale"
Nice quiet area there in Caldwell, Idaho. Did a bit of geocaching while we were there. Visited with my wife's sister and her husband in Homedale. It was quite hot all over the NW in Oregon, Washington, Idaho, and evidently northern California too. Big heat wave this year. Lots of agriculture areas around to observe. The breakfasts at the Best Western hotels are always so plentiful and complete. The only other comment would be that they could add door stops to the bottom of the doors so that you can get in and out with a luggage rack and cart before the door hits you. Otherwise and nice hotel. 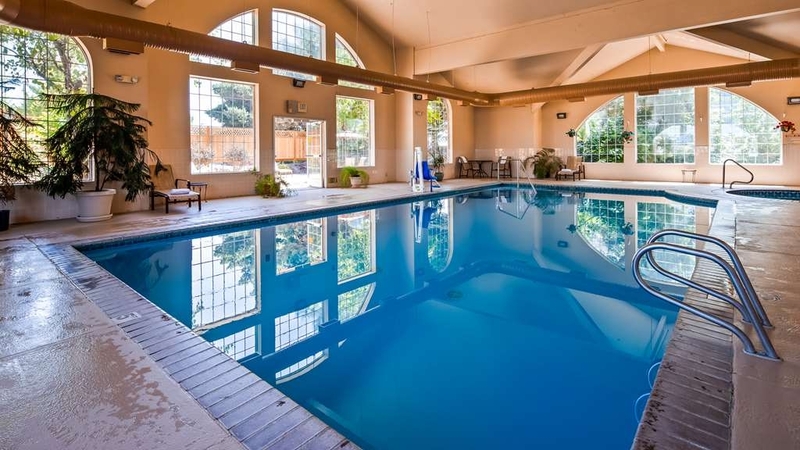 Has an indoor swimming pool and exercise area. "My experience at the Best Western Hotel"
I used to live in Caldwell so return once a year to visit my friends and family. It's so convenient to have breakfast at the hotel and not have to drive somewhere. Having cookies in the afternoon is a plus. The staff is always helpful in any way. One young man helped load my heavy suitcase in the car for me this time. Another time the manager herself helped load it. It's clean, quiet and a very nice place to stay. This place is worn down. Staff is friendly, but housekeeping left my room uncleaned. The breakfast was standard, and the location is very convenient. But, truly, next time I'll try the Holiday Inn down the road in Nampa. We are really sorry that you were not happy with the quality of your room. All of our standard rooms have brand new tables and chairs in them, i do see that you were in a mini suite, which is the only room type that does not have that furniture in it. We have added all new fencing in the back patio area, we have brand new flooring in the lobby, as well as we have just got done redoing all the lobby walls, and we also have brand new breakfast and lobby furniture on it's way. We do try and do the upgrades at times that will not inconvenience the guests. "Nice place to stay and get a good night's sleep"
Just a short drive to all the Boise area. Spacious room, comfortable accommodations. A good breaks if a little monotonous after a few days. The people were super nice. They helped me arrange are stay at our next stop in Nevada. "One of the best stays ever"
We were on a girls weekend to visit the vineyards. We got a huge room with 4 beds that fit all 5 of us comfortably. They have a great breakfast every morning and Lynda from the front desk went out of her way to make sure that we had everything we needed. I have stayed at this hotel several times. It is a very nice hotel the staff is friendly and helpful. Nice place to stay with a friendly staff and it is clean. They accept pets which is nice. I would recommend this hotel. 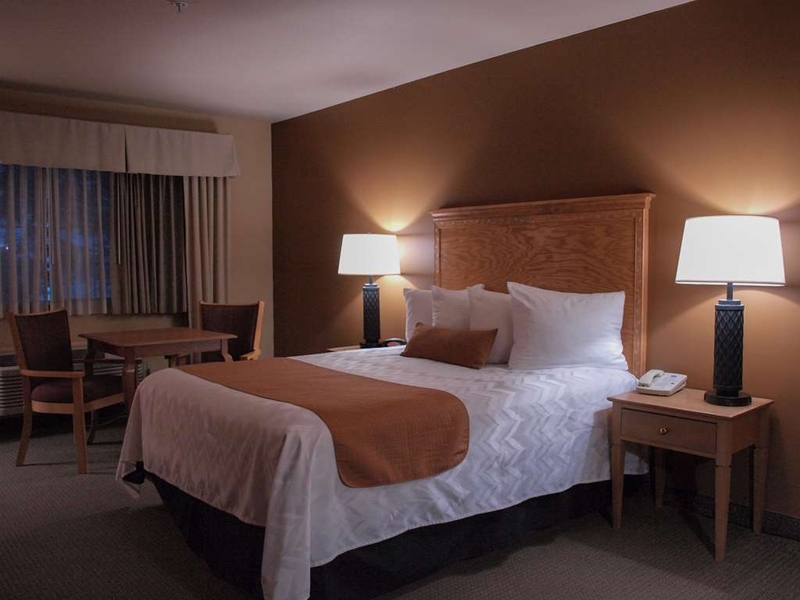 "A good hotel and conveniently located"
The Best Western Caldwell is conveniently located right off the I-84. The staff is always welcoming and helpful and the rooms are clean. There is a Burger King next door and a good diner right across the street. A great place to spend the night or two if you are on the road. "I would stay here again"
When we checked in Linda who was at the front desk noticed the rewards number that she had was not the right one she immediately corrected it.She was on the ball. The rooms were very clean as was the whole facility. The breakfast room and the breakfast was quite good. I would stay there again hands down. My Dad had surgery and I need an affordable clean room, The staff and room were great! Just what I needed and a great breakfast too! Close to the hospital. All my needs were met and they give me a great room. "Too much money for what you get"
The hotel website stated there were washers and dryers. There was one set of washing and drying machines they were both broken. The hotel website also stated air conditioning. It was over a hundred degrees outside. The room was extremely hot and took over 2 hours to cool down. The room never got really cool. I reported these issues to the hotel staff and was given no Solutions. I asked for recommendations for dinner and was given and Chinese food restaurant menu. We threw away most of our food from that restaurant. The beds were comfortable the room we got was large. The breakfast was good. I would not return to this location. The Best Westerns have normally been very good. I am really sorry that the hotel did not meet your expectations. As i stated to you earlier today, We do not own those machines ourselves and our policy is, if they are not working for any reason, then we do the laundry for you in our machines. So again i am sorry that this was not communicated to you. As for the weather outside, no one is happy about 104 outside temperature and it is true under such extreme weather it can take time to cool a room down to 65 degrees. We have several other restaurants right within walking distance of the hotel. there is a burger king right in our parking lot, and also a family cafe across the street. We have never had a complaint about the cafe across the street, i believe they do a great job. We've been here twice now, and coming from California, we weren't sure what to expect about the place, location, etc. It's perfect! 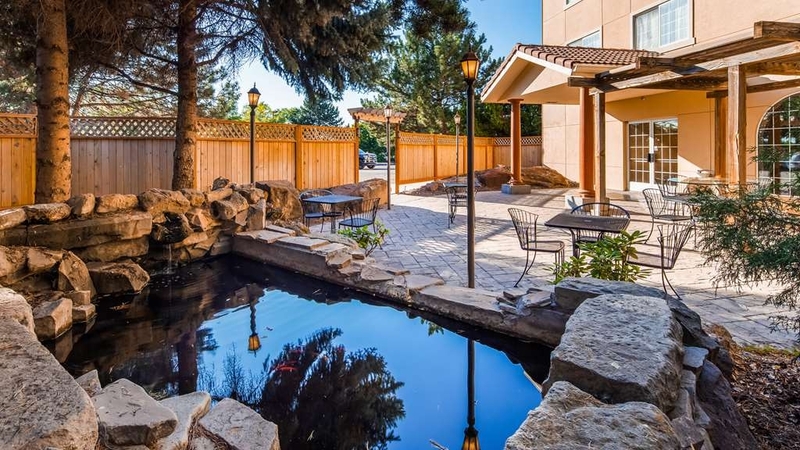 Right off the freeway, blocks away from the College of Idaho, and has everything we need. Rooms are very nice sizes and very clean. The full breakfast is a plus. The staff is very friendly and accommodating. We will be back! I cant say enough about the service we received at this Best Western in Caldwell. When we got there to check in we found our reservation for a handicapped room was mixed up. All handicapped rooms were unavailable. So Mindy and Ana help us out and upgrade us to the executive suite. WOW! It was wonderful.. Beautiful decor, spacious and comfortable. They also gave us extra waters and a goody bag. I really appreciate their effort to help us out. A very clean hotel. The staff was friendly & helpful. We didn't like the first room, so Linda, quickly moved us to another room. We slept very well. Their eggs at breakfast were tasteless & powdered. The biscuits were hard as a rock. I didn't try anything else. We were traveling with our dogs & felt the room was very clean. Inviting exterior with water feature. Quiet location, friendly personnel and spacious room. Fast internet, Large pool, excellent exercise room and wonderful hot breakfast. Will definitely stay here again. The Caldwell Inn was in a great location for a road trip. Easy on and off the highway. Plenty of eating places nearby for dinner. Bed was great and comfortable. However the breakfast was less than desirable. Items were cold and was not presented well. 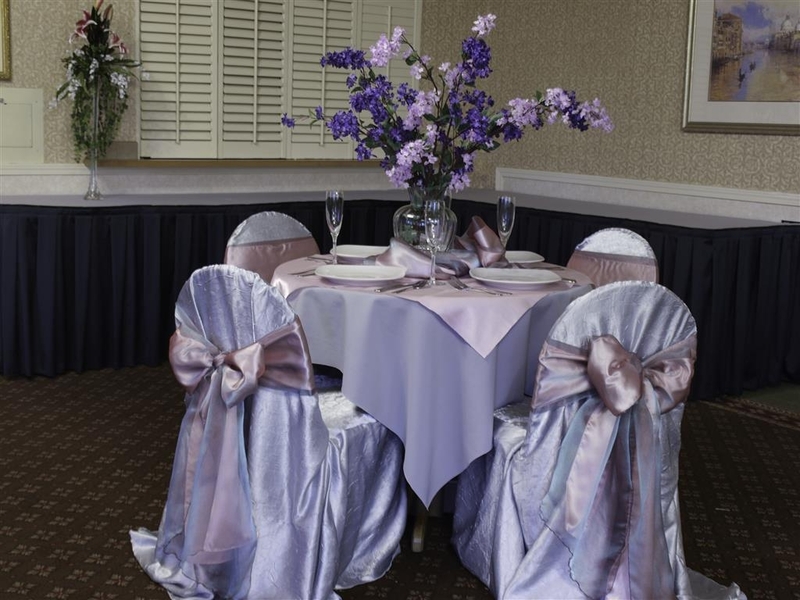 "Quick Trip for a Wedding Reception"
Nice updated hotel and friendly staff. Great pool area with perfect sun in the morning. Little early wake-up call from the nearby train in the morning. If you are opposed to the smell of cigarettes in the building you may want to find a newer hotel. Staff was friendly and helpful. However, since this is now a totally pet friendly hotel, we will no longer stay here. Seems they care more about people with pets then people with allergies. Allowing animals to walk all over the halls, in the lobby and breakfast area is not acceptable to us. "Over all a nice Hotel"
We have stayed here a few times, it is close to family. So, it makes this hotel very convenient. This last visit we stayed on the lower level, it felt like a dungeon. Very dark. I much prefer the main level, a lot more light and it just seems much nicer. When we checked in the staff seemed very nice, but a few days later when we checked out not so nice. A little on the grumpy side. They really need to work on that. We will probably stay again, like I said it is convenient for us and we only sleep there. This hotel allows pets but isn't really per friendly. There was absolutely no place to walk your dog. Had to borrow grass space from the neighboring Burger King. The staff was good, the room nice but the location weird. Right across the street from a stockyard. Luckily there weren't any cattle there during our stay. Unless you like Burger King plan on driving into town to eat. "Best Hotel in Caldwell Idaho"
This is the best hotel I have stayed in while in the Caldwell area. The staff are very professional, friendly, and helpful. The caring and friendly attitude of the staff is contagious - and we have noticed how happy the guests are too. We enjoyed sitting on the patio in the evenings, meeting people from all over the world. And, as our other family members were complaining about the other hotels they were staying at, I believe that we have recruited many of them to stay at the Best Western next year. "Do not sleep in a hide a bed"
Friendly staff. Clean throughout. We also swam. Pool nice temp. Clean and inviting. We stay servers times each year for sports/tournaments. Burger King clean nearby. Great homemade food across the street at the truck stop. Friendly staff, spacious rooms, variety of breakfast options. The large pool was an extra treat. It was well worth the price. The wired internet with cord provided had faster speeds and more privacy. There was also a wireless option for phones and tablets. Convenient to freeway but didn't have freeway noise. "Nice clean hotel, friendly staff"
My granddaughter loves a nice pool and hot tub, and this hotel did great in that aspect. The friendly staff loaded us up with fresh baked cookies, and gave us good information on the local area. The room we had was larger than typical and clean and comfortable. Chose this place for the photos of pool. So nice to sit around looking out big windows at nature, while the grandkids play. The staff was so very helpful and the room just fine. Appreciated that they gave us breakfast passes for the restaurant next door. The best fruit and veggie stand ever is adjacent to this place! "We can always count on this Best Western"
My husband and I grew up in Caldwell, Id and have come often to visit family, as well as attend funerals and weddings. There is never any question as to where we will stay as this hotel is always clean, the staff are friendly, and the breakfast is good. They will go out of their way to help. This is our "Go To" hotel when visiting The College of Idaho in Caldwell. The location is right off the freeway but far enough to not hear any of it. It is within a few blocks of and feels like your practically on campus. Plenty of everything is available in the surrounding area. The hotel is nice and they keep it updated, every employee is always willing to assist with any request. The prices are reasonable for this location. The bed was comfortable and we were able to cool the room without having the unit go on and off all night. We had 2 dogs, and they were very pet friendly also. Breakfast was not skimpy. There was cereal, eggs, sausage and potatoes. Took my children to a conference they were invited to attend and tried to find closest hotel so commute to drop them off wouldn't be a hassle. This hotel was close to campus. The staff was great and the rooms were nice as was the interior of the hotel. The only thing I found lacking was the quality of the 'hot" breakfast. I found the eggs, sausage, potatoes, and coffee to be mediocre at best. The rest of the breakfast, cereal, juice and yogurt were good. Our family gathered from Idaho, Washington and California for my mother. The hotel staff was welcoming to us. We spent 2 nights and were able to use the pool, lobby couches, and breakfast room. All was terrific. This is our second stay at the Caldwell Best Western. Friendly staff and confortable room, especially the bed and pillows- I wanted to sleep longer. Only negatives were the desk chair was stained and they' ve switched to preformed egg patties at breakfast instead of real scrambled eggs like they had before. Would and will stay there again. Very comfortable after a long day of driving. Friendly staff, huge room!. Hot tub was relaxing and pool was cool. Surprisingly few kids there, but that might have just been luck of the draw. West of the traffic, which was perfect for us. Would gladly stay there again. Very clean, very nice staff. Great Location. We did not have a reservation and were able to get a room on a moments notice - on a Friday Night ? Saturday early early morning no less. THe staff were extremely helpful. Love Idaho!!!!! Great facility Gives discounts for family visiting to watch sporting events at College of Idaho. Very great benefit as well as nice place to stay. Super full breakfastls that far surpssses other hotels. Visited Caldwell to see the College of Idaho. Great location very near campus. Reservation and check in staff very helpful and friendly. Room was very nice, price was great, included breakfast buffet was more than the usual, nice selection. Would def. stay again. "Pet friendly and superior service!" We have overnighted here twice on our way to and from California. On another stay last year, I found out upon returning home that I had inadvertently left a tote bag behind in the room. I immediately contacted the hotel front desk and was so relieved that the staff had turned it in and the hotel manager Stacy Ward took care of shipping the bag back to me. There is also a Sage restaurant across the street from the hotel worthy of mention. It is a truck stop and the food is good and reasonably priced too! 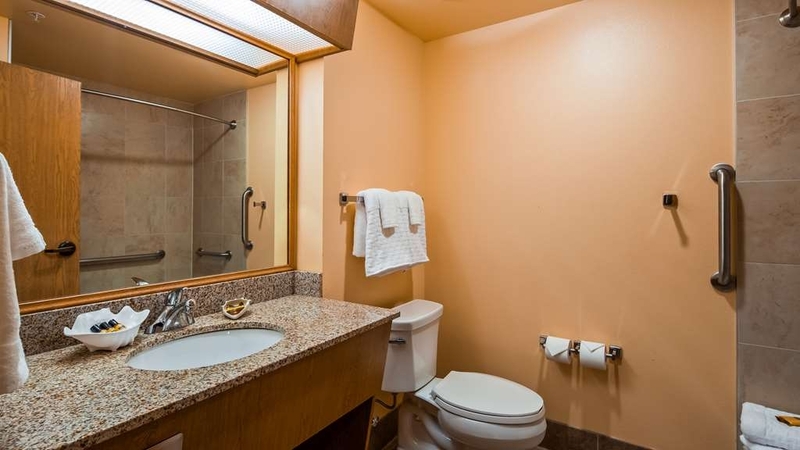 "Best Western Plus Caldwell Inn & Suites, Caldwell, IDAHO"
This Best Western Plus Caldwell Inn & Suites, Caldwell, IDAHO Hotel is recommended. 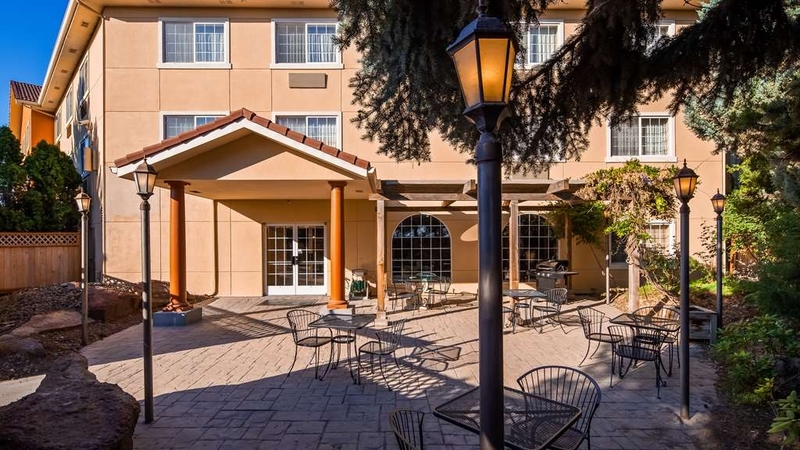 Location is on I-84 and Franklin for easy access from the freeway, Full complimentary breakfast is available, Quiet room and spacious for a comfortable stay, Well maintained facility inside and out. Thank you for choosing us. I realize that you have a lot of choices and thank you for choosing us. We are really glad that you enjoyed your time with us. We strive to make every guest feel like a guest. Hope to see you again. "Stayed on Friday night, then again on our way back home from Reno." We were on the 3rd floor the first night and 4 days later stayed on the 1st floor. The first floor was a lot noisier. Both rooms were clean and comfortable. The breakfast was good and there were lots of choices that differed on each day. There was a funny smell in the TOWN on both visits. We asked what it was and were told it was sugar beet season. It was only apparent outside the building. The location was very convenient. 4 exits up the road is Texas Roadhouse, Outback, Movie theater and lots of shopping. The room was very large. The room was spotless. The staff was very well trained. The first room had been smoked in. And they moved us immediately into a very deluxe room at no additional cost. I am back already as of this writing. We are a frequent Best Western customers. As typical, we found our room clean and comfortable. 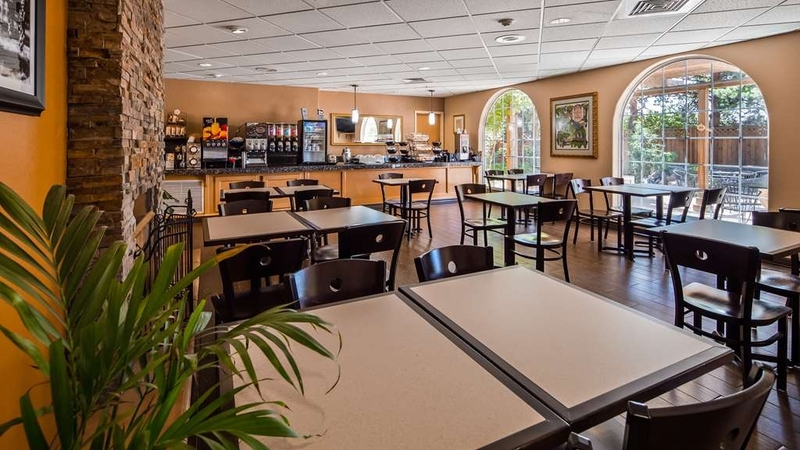 The continental breakfast area was clean and provided a variety of breakfast foods. Upon arrival, we were greeted by Andrea. Such a lovely and pleasant person. She was the only one on the desk, and was multi-tasking, (answering phones, taking reservations, helping new customers as well as attending to customers checking out). Although Andrea was extremely busy, she maintained a very pleasant and personable attitude, making the check-in a pleasure. The hotel has plenty of parking and entry doors close to the stairwells for convenience. The front lobby was under construction, however, the staff was making every effort to mitigate the inconvenience. We can appreciate the upgrades. The hotel itself was quiet, but the two nearby trains that blew their horns at 4:00 and 4:30 AM was not a welcome expectation. Cant fault the Best Western for that. We have always found Best Westerns accommodating, and we will continue frequenting their hotels. Dirty, noisy, with all the creaking floors and slamming doors, carpets were filthy, and I averaged a bug bite a night. On my third night I noticed white dried spots on the throw pillow in the middle of my regular pillows. I took the pillow to the front desk and they were disgusted. They offered me another room. I just asked for new pillow cases. The next day I returned from work and my room wasn't cleaned at all. I went back to the front desk and they offered to send someone up to clean my room, but I turned them down. There must be a cattle feed lot or dairy nearby, there is a strong smell of cattle waste outside. It's just not worth the chance. I would like to thank you for staying with us. We are truly sorry that we did not meet your expectations. We really strive to make our guest experience great, and we failed to do that for your stay. "These Folks know how to care for us folks"
The Staff at this hotel are in the people business, most seem to know what we wanted or needed before we did. The breakfast was outstanding, the night Desk Staff was helpful, not so much in the morning. This is clean, enjoyable, they just know what is important, us. "Great experience. We love Linda." We stay here anytime we come to the Boise area. It's a great hotel always quite and the breakfast is great. Linda at the front desk is the Nicest I have ever delt with at any hotel I've ever stayed. She has loaned us her own jumper cables. She is always pleasant and willing to help anyway she can. Love the exercise room and the pool area. The overall hotel is very clean. Stayed here on way home from Arizona. This is a pet friendly hotel. The check-in was easy and the clerk was very helpful and friendly. The room was large with a separate sitting area. The room was clean although a little in need of upgrading. Breakfast buffet was above average for a free buffet. As always, the Best Western Plus Caldwell Inn & Suites met all expectations. The reception staff were extremely helpful and friendly at check-in and check-out. The room was clean and the beds were comfortable. We didn't take advantage of the breakfast on this trip, but it has always been exception on past visits. We always have a great experience. The staff does a great job of accommodating us for our room. They have a great breakfast, the rooms are always clean and the staff is always so friendly. We look forward to our trips to Caldwell and staying at the Best Western. We had a very comfortable quiet room. Must go to Indian Creek Restaurant in downtown Caldwell. Great prime rib. Also great Mexican restaurant on 10th Street. We are headed back for another stay next week. Taking horseback riding lessons with Henry Nable. Amazing trainer and teacher. Folks at Motel very kind and helpful! Brenda is such an amazing asset, she made our stay so much better. My kids and I felt cared for and safe. Chantelle, Linda and the other staff are great as well. We stay there every time we visit my father because of the staff! Thank you for staying with us. I know you have a lot of choices and i am glad that you feel cared for here. Hope to see you again soon. Great staff and very quiet room. Location not bad, close to highway but suprisingly quiet . Not much in walking distance but a short drive to retail. Staff was friendly and helpful . Pool and hoot tub were good. Stayed at this hotel for leisure. Breakfast was hot and had a variety of items. Staff cleaned up breakfast area when messed up. Had a room with a view of the trees in the back, and not much else, but overall, was quiet and nice. OK for the price. We had a basement room facing the freeway which was not so nice. I would ask for a room NOT in the basement. Freeway noise was minimal however. This hotel needs updating, it is worn out. We were in the area for business and stayed 4 nights at this location. Our room was quite, clean and the bed was comfortable. We will be back in the area this coming spring and plan on staying at this location even though it is farther than some other hotels, because of the caring staff and the value. 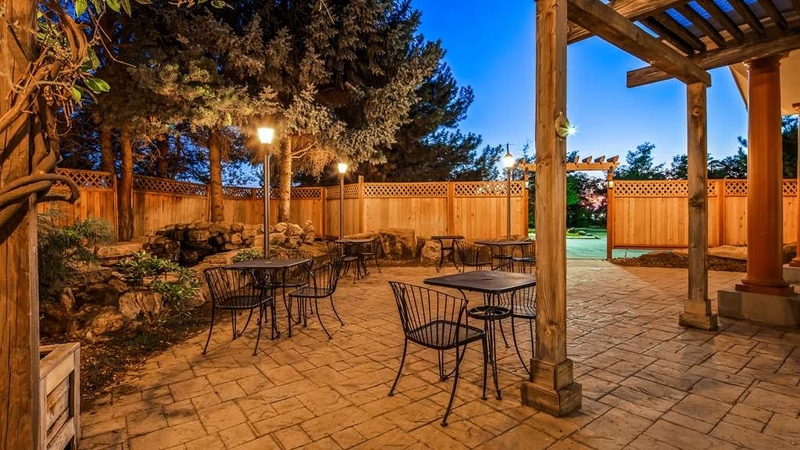 The location is right off of the freeway and has a few restaurants within walking distance. We loved the fact that the pool & spa was open 24 hours a day, so at the end of a long show, we can take a Jacuzzi and relax. Staff was nice and very and very accommodating. Continental breakfast was fresh an area was well-maintained with fireplace and area to purchase snacks beer and wine. Property appeared to be very secure and was very comfortable. Other hotels in the area were at least $50.00 per night more. We were pleasantly surprised by this property. Rooms were very clean, staff was friendly and helpful and the breakfast was far above what you get at most "breakfast included" motels. Easy on and off the interstate. From the little fountain out front to the cute plaza in the back, this hotel had a special feeling to it. The staff were genuinely friendly and helpful, and gave us cookies right out of the oven when we arrived. The location is even great - close to town and also the interstate. We would stay here again - a chain hotel with a special touch. Nice property, attentive staff, nice hot breakfast, clean comfortable room. Didn't use the indoor pool, but it looked nice with plenty of deck space. Convenient location, right off the I-84 exit. Plenty of parking. Awesome place to stay, the staff was very friendly and helpful! We enjoyed our weekend! The cats in the courtyard were cool. Breakfast was really good! Would recommend that anyone stay there. This is out second year staying there and we plan to stay there again next year. "First Night of a Long Journey"
Travelling with only my cat as a companion, facing a 3000 mile journey on the road, I was concerned about safety and comfort. This BW Plus was perfect for me, good location, great staff, quiet and well appointed room. Everything went smoothly, and it was the perfect start for my journey. Thanks for making what could have been scary into a lovely evening. This is a nice facility, with one drawback I'll come to in a minute. The room and bed were clean and comfortable, the bathroom was clean with a good-powered shower, and the breakfast buffet is well-maintained and given constant attention. The staff were uniformly friendly and helpful. The one downside was the quality of the wifi, which was virtually inoperable most of the two nights we were there. "Best best western hotel ever"
This has to be the best hotel I have stayed in, amazing value for money. The check in was faultless and the assistant manager (I forgot her name) was possibly the most friendly person o have ever met. We used the hot tub and pool initially (as we had just driven for 6 hours) and it was fab. Then we had a very nice rose (Indian hills) and a few beers in the garden area. Great rooms for a solid night sleep , gym is well equipped, and breakfast is excellent. I would highly recommend this place ! 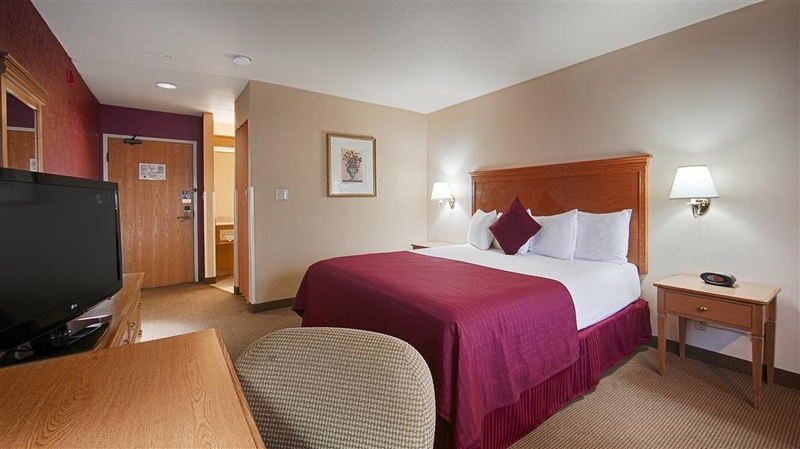 "Recommended Stay in Caldwell, ID"
Nice facility and stay. The location worked out well for our travel this trip. We found the staff very accommodating and the room was good. Bed was grea and the rooms very goodt. We were on the second floor and the elevator was slow and inconvenient. Recommended stay, however. This Best Western is perhaps the best one we have ever stayed in. Everything is always perfect and the service is awesome. If you have a problem just tell them and it will get fixed quickly. At least with the few times we have had problems they have been. We didn't have a reservation, but there was only one room left. Some big concert in Boise. The one room left was a king with a queen sleeper sofa and 2 tv's. It was more than we needed, but it was a wonderful room. We slept well. It was very quiet. Had an okay breakfast and we were on our way. The staff was very nice and accommodating. Check in was easy since I had reservations and the clerk was helpful as to which door to come in. The room was very comfortable and the breakfast in the morning was tasty. This could be a good room to have for several days. Very polite staff. Room, pool and hot tube clean. Beds are comfortable, and spacious. The morning breakfast buffet was one of the better ones that we have ate at. Building clean through out. They were booked full the night we stayed and heard very little noise. 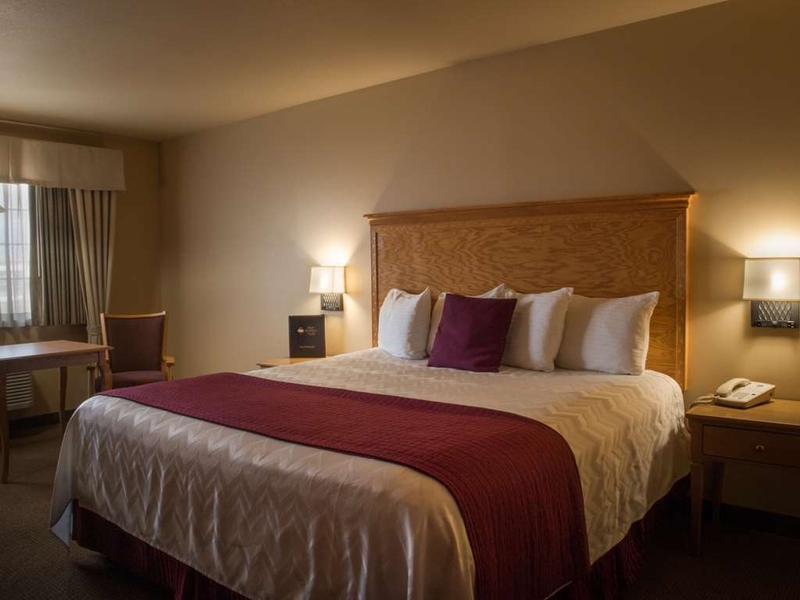 "Very nice facility, excellent staff"
I was in Caldwell for two nights for business. The hotel is right off Interstate 84 and Caldwell, though a small town, has plenty of restaurants. The staff happily allowed me early check-in. My room was perfect--comfortable and quiet with a good bed. Breakfast was very good. This is our favorite Best Western Plus yet. We stayed at 3 different cities on our trip. The rooms are nice and clean. They have full size bath towels in the bathroom. Great hot breakfast, they even had biscuits and gravy. The chlorine level in the indoor pool and spa is perfect. The staff is very helpful and friendly. Overall a great place to stay! "A very nice place to stay"
As this was the second time I had stayed here on passing through to Phoenix I was pleasantly surprised to be treated the same as before. Excellent. The room was clean and well appointed and the bed very comfy. It is handy to the highway but not on it. "Comfortable bed, High shower spigots, K-cups"
Very comfy large King bed. Quiet room. Couch very uncomfortable to sit on. Needs a chair in the room . Large tv's..... difficult to locate abc, cbs, nbc channeling. Nice pool area and hot tub. Exercise room was large and fully furnished. "WE had an ok stay here"
Our stay was ok.. The pool was good. The hot tub wouldn't turn on. The help came but it still didn't work. The pool is indoors which is nice, but we had some kids that screamed and it echoed which is not the hotels fault. The room was ok, but it could be updated a little bit. It is an older hotel and they need some upgrades, new carpets etc. They need to clean around the edges, if you know what I mean. It was ok everywhere else. We stayed here as we were attending a family wedding close by. What a pleasure! Our accommodation was lovely, large comfy bedroom, with a separate sitting room. The decor is a little dated and tired - but everything was spotlessly clean. (The light switches were a little confusing, and the RED light that stays on when the light is off is a little annoying as you can't help but see it from the bed) All the staff from front desk, to the breakfast staff and housekeeping were friendly, accommodating and really sincerely wanted us to have a great stay. The hotel was fully booked on the first night and our room was above the main entrance so it was a little noisy...but it certainly didn't detract from our stay. The breakfast exceeded expectations, fresh eggs, sausages & homemade biscuits and gravy. A good selection of breads & pastries, yogurt and juices. The fresh baked cookies in the evening were a lovely touch - as was the fresh fruit and iced water and coffee available 24/7. Thank you for a lovely staff, we wouldn't hesitate to come back if we were in the area. thank you for such a nice review, we are really glad that the wedding party was great for you and your family. we know that travel can be stressful and we really try to make it as easy as possible for our guests. 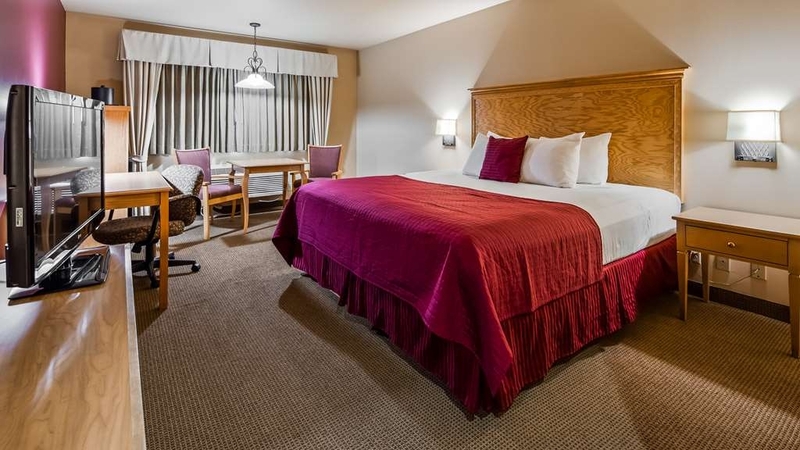 "Best Western - Best Experience"
Great Hotel, always clean rooms, great friendly and helpful staff. Stay there all the time when I'm in Caldwell. Referred many of my family and friends there. 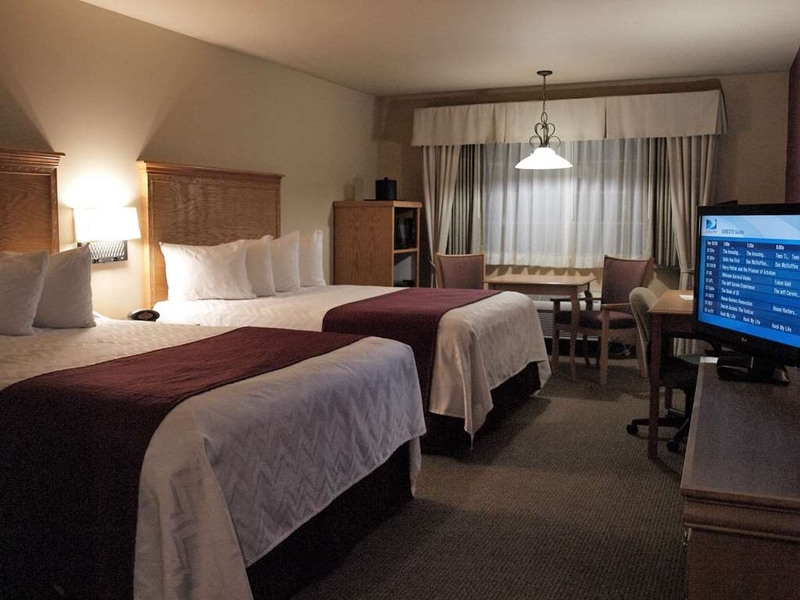 We consider it our home away from home when we travel to Caldwell, Idaho. We stayed for four days while visiting grandson and attending the 'Yotes football game. It is very close to the College of Idaho campus and stadium. They provide a free breakfast buffet and there is a Burger King right across the parking lot. Had a clean, quiet room. When we found out the visiting team would be staying there, we were worried, but it was quiet. Will stay there again in the future! "Excellent stay and they take pets!" This hotel was new and clean- such a bonus they allow those of us with pets too. There was a huge HEATED indoor pool and hot tub- the water in both was the cleanest I have ever seen! We had both to ourselves and it was so nice to swim and then hot tub. The rooms were immaculate- it was the nicest hotel we stayed in during our 2 week road trip. There aren't a lot of restaurants right near but there is an earlier highway exit with a ton of places- it's worth it to pick up your food and take it to this location in Caldwell! 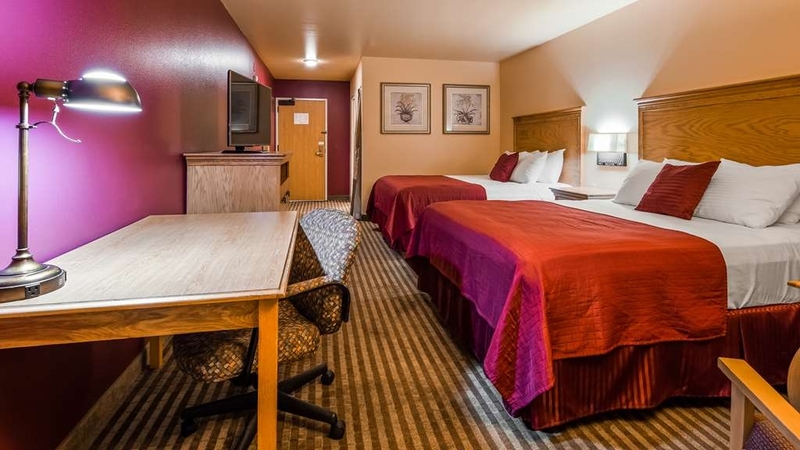 If you're looking for a quality hotel at reasonable prices in the Caldwell/Nampa area, we would highly recommend the Best Western in Caldwell. The staff has continually gone out of their way the past few years we've been visiting and the beds are comfortable, breakfast good, etc. We especially appreciate the discount for College of Idaho families. "ONLY PLACE TO STAY IN CALDWELL!!!!" We've tried both hotels in the area - close to the college campus. The other one is more expensive, unfriendly and uncomfortable. After staying at BW, I would never go back to the other one. The employees go above and beyond the normal to make sure your visit it spectacular. I was beyond impressed with their positive, friendly, upbeat and helpful attitudes! 2nd time that we have stayed at this hotel in the past two years. The first time was in the new part of the hotel. This time I asked for the new part also. The room maid even left a note for us which was a nice touch. The attendant working the breakfast was also very nice. They had run out of Chobani yogurt and my wife asked if they had anymore. He gladly got her some more. I will stay at this hotel again. 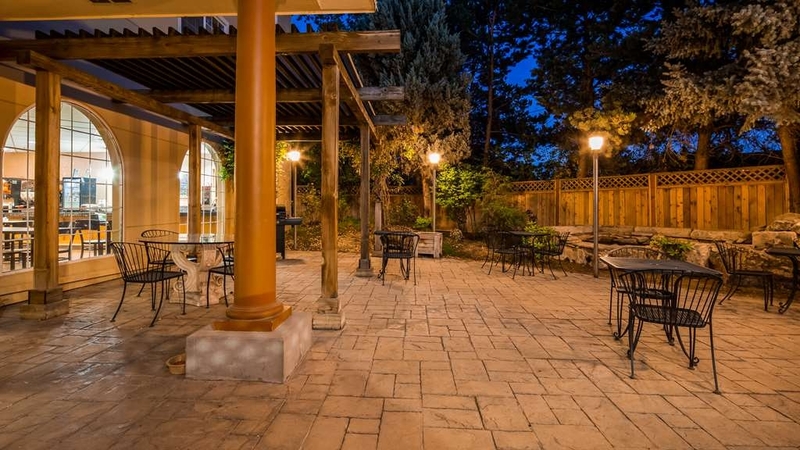 "Jewel of the Treasure Valley"
This property is perfectly located for a Boise area visit without having to deal with urban hub congestion. Access is quick and easy from I-84. Breakfast is ample and tasty. Breakfast hosting is pleasant and attentive. Tables are continually being cleaned and readied for the next family or solo traveler. Overall hospitality is marvelous. The inn has been rejuvenated several times in recent years. 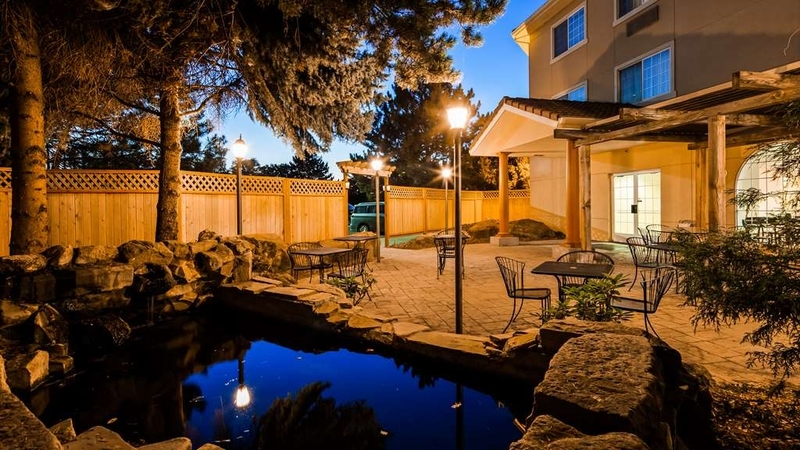 Avoid the Boise rat race, stay here! "A quality place to stop"
This Best Western has been a wonderful place to stop. we have a 6 year old Yellow Lab that is welcome here. Linda at the front desk always welcomes us and give the dog a treat. the staff is friendly, the rooms are very clean, and its affordable. Nice job BW! Extremely satisfied with the room and the friendly and helpful staff during check in and check out. We visit a couple of times each year because of our daughter attending COI and this is always our first choice. Nice rooms, very clean and the breakfast was great. They serve sausage, scrambled eggs and biscuits and gravy. Along with the normal, fruit,cereal and self serve waffles. The pool and workout room are open to adults 24/7 s that is a real plus too. Staff very friendly. Our family had two rooms and a three night stay at this hotel. The basics are all here - coffee maker, iron and ironing board, blow dryer, extra blankets and pillows and towels already in the rooms. The breakfast included in the room price is the same every day, but does include hot food (scrambled eggs, sausage, bacon, gravy, potatoes), and a selection of cereals, breads and fruit. Rooms and common areas are very clean. All staff was very friendly and accommodating, including the cleaning staff. We were always greeted when we came in, and wished well whenever we left the building. Only room for improvement is the weak Wi-Fi signal, but no complaints aside from that. We would definitely stay here again. This was an average experience. Reception was friendly, but rooms were dated, the internet signal was very weak. TV was very average quality. Ok for the money. Breakfast was not great, perhaps average, Bed and carpeting need to be updated. i would like to thank you for taking the time to write a review of our hotel, listening to our guests, provides us with the feedback we need to better meet the needs of our guests. i read all of our reviews and speak with guests as often as possible. I am sorry you felt that our rooms were dated. i am not sure how far along we were in changing out the furniture when you were here, but every room in the hotel has a brand new activity table and two brand new chairs in it. it did takes us some time, changing everything out. 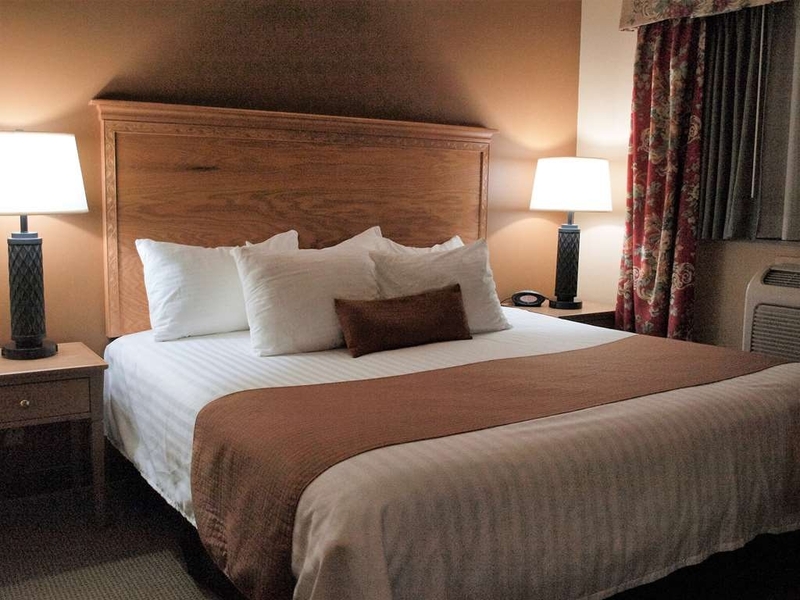 our beds are all pillowtop serta mattresses, with brand new locally new handcrafted headboards. It did take us some time to get those all in, for each headboard was handmade for this hotel. You will not ever see our headboards anywhere else. I try my best to make sure that every piece of furniture that is put in this hotel is of the finest quality and craftsmanship. This is one of the best places to stay in Caldwell, Idaho. We always stay here when we are traveling in this area. Staff is very helpful and breakfast was very good. Facility is very clean. We have never been dissatisfied when we stay here. I would like to thank you for staying with us, when you are in the area, and thank you for taking the time to write us such a nice review. It really does mean a lot to us to hear from people that enjoy staying with us. As a Best Western we try and make every guest every time, happy that they choose us, we don't always make it, but it does mean a lot when we do. "Good value, clean, good location." Stayed here using the military rate and it was an excellent value. The rooms were clean, nice lobby, and excellent breakfast. Nice patio area with little cute cats that seem to live there and get fed by the guests and the pool area is nice as well. The hallways smell kind of funny and seem muggy, which is weird considering it is Idaho and very dry. Overall, this is a good place to stay and if you are a veteran, book with the military rate and get extra savings! Fantastic. There was not much to choose between when looking for a hotel in the area. Booked this hotel and did not expect much. The hotel was better than we expected. Rooms large enough, and clean. The breakfast was below average of a hotel breakfast. But it was included in the price, and for the price we paid for the room perhaps what to expect. I have stayed at this hotel for the last eight years. I have found it to be clean, economical, and staff friendly. I would highly recommend this hotel for anyone doing business or staying overnight in the area. One of the FINEST Best Westerns we have stayed in. Staff was VERY friendly and helpfull. We will highly recommend to all our friends and family. Next time we are in this location, it will be our only choice to stay. Comfortable bed, lots of pillows, nice shower. Everything seemed clean. Luggage cart and elevator made it easy to get our stuff from car to room. The hotel gets a higher rating from me because of food selection at breakfast, including hard-boiled eggs and Greek yogurt (not just carbs). Info book in room seems out of date - TV channels are not correct, and it says we had a refundable pet deposit but that wasn't mentioned at the desk. Our stay at the Best Western Plus in Caldwell was very pleasant. The rooms were clean and the beds were alright. We loved the 24 hour pool with hours for adults only. Great location if you want to stay outside Boise. The cream cheese cinnamon rolls are excellent!!! I'd recommend staying here. "Clean and quirt room. Breakfast basic." The room was clean and quirt. The bathroom was very small. Breakfast very basic. Front desk staff should take a lesson in communications. They don't listen to you, and they are trying to do 5 things at the same time, which they cannot. Would I stay here again? yes - for 1 night only. We were on our way home from a two week adventure and had stayed in many Best Westerns, this one was one of the nicest and I think had the friendliest staff. We would definitely stay here again, beds were comfortable, had room to roam and when we had an issue with the sink, the young man was at our door in a matter of minutes and out just as quickly. 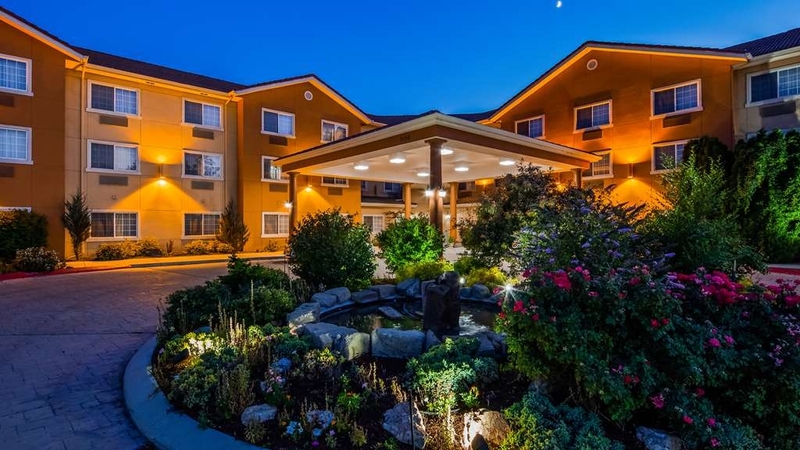 There are very few choices in and around Caldwell, Idaho, so we were happy to be able to find a Best Western for our one night stay. While this was not as good as pleasing to the eye with the same amenities as the one we stayed in in Salem, OR a wee or so before, it was probably the best option Caldwell had to offer. Great hotel. Great location - just off Interstate - easy access. Great employees - very helpful and pleasant. Will always stay at this hotel when in the Caldwell area. Good restaurant nearby. Included breakfast was very good. We have stayed at this location so many times over the years that I have lost count. The first year we stayed it was almost brand new, and it has improved with age. It still looks new, well kept, and is very clean as of our last visit. We always enjoyed the breakfasts each morning, very delicious with a lot to choose from and a friendly breakfast staff. The area outside of the dining room is lovely and we have many memories over the years of visiting with family and friends in this cozy outside area. Loved the pool!! We will certainly be back, and hopefully soon!! "Clean, comfortable, nice staff and hot breakfast." The hotel was easy to find and was centrally located. It was easy to check in/check out. I did not partake of the hot breakfast but that was a nice attribute. The price was reasonable. The room met my needs and the bed was comfortable. The noise outside (train passing by every 2 hours after 2 am) was mild-moderate, but I had the window open so that is my fault. Overall, I would most likely stay there again. We love this place! Its not a question for us if we are near here, this is our stay. Unfortunately we were not able to stay here (Fully Booked) on our return trip and were forced up to Ontario,OR (Summer travel is rough!) where we paid more for less. This is not a spectacular modern masterpiece of a hotel. It simply does not get anything wrong. That is something way greater. As many times as we have been here we have never been let down. And the breakfast is GREAT! This hotel is in great shape & the staff was helpful. The room & pool area were very clean. The pool & hot tub were just what I needed after driving for 8 hours. We sprung for a room with a jet tub, which was well worth it, in my opinion. 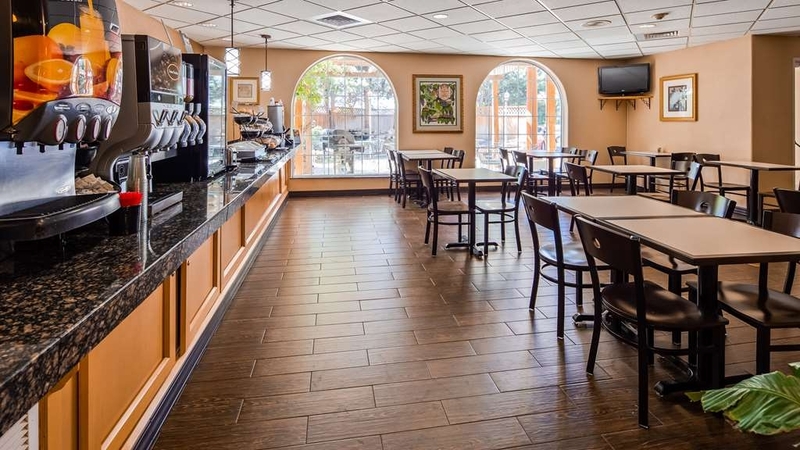 They offer a decent continental breakfast, but there is good food within walking distance. Don't let the truck stop across the street fool you! It houses the Sage Cafe, which has great diner food. Lodging was clean, quiet and comfortable. The room was up to date with two very nice queen beds, average sized flat screen television. 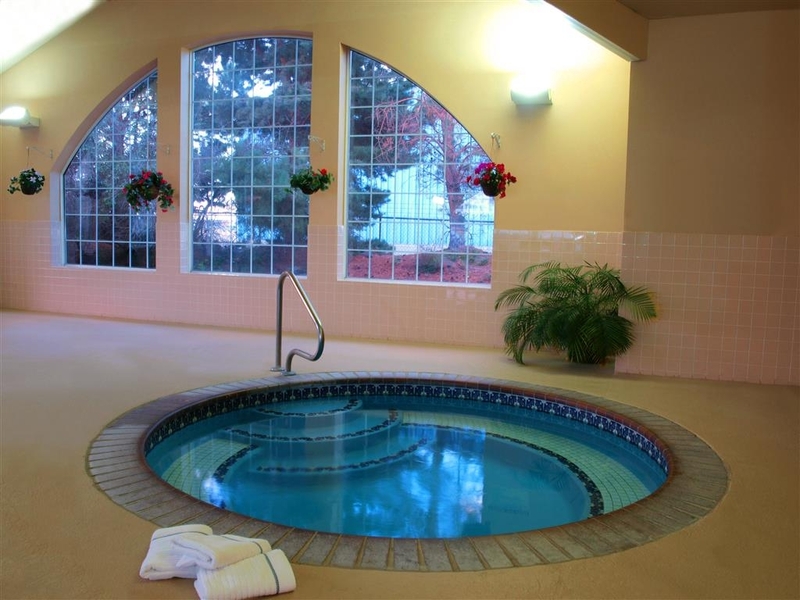 We used the indoor pool and hot tub, both were very well maintained and good sized. The breakfast in the morning was better than most with fruit, juices, eggs, potatoes, pastries and coffee. Overall very nice. The staff at this Best Western makes it worthwhile. They are always pleasant and very helpful. We always enjoy our stay there and would not consider any other brand. The parking is a slight issue, but it is manageable. Pro's: The room was clean. Bed was comfortable for me. For the most part it was quiet, aside from the early morning train horn in the distance. The price was right. Con's: One receptionists, they only have one on duty at any one time, was less than friendly, bordering on rude. Maybe she was having a bad day. Not too many dining choices in walking distance. I reviewed the BWP in Las Vegas. It was really nice. This one was just ok. I'd probably stay there again based on the pro's listing above. A fairly typical Best Western which of course is why you choose a chain since you pretty much know what you are going get when you get there. 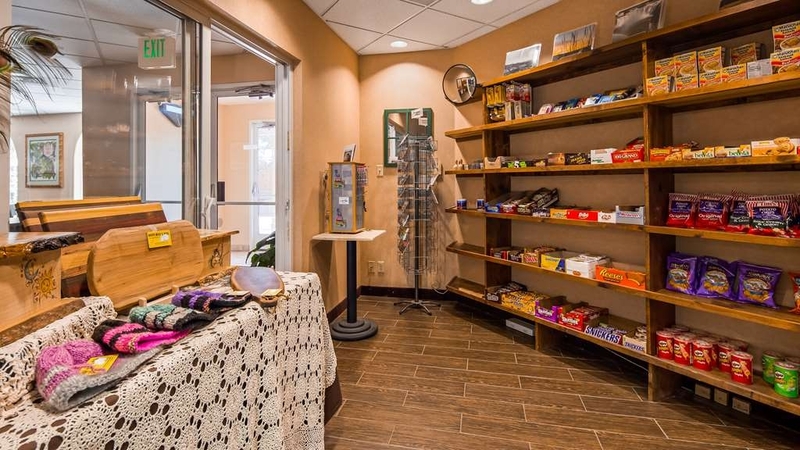 Very nice breakfast bar in the morning, coffee available 24 hours and cookies in the evening, far enough off Route 84 so that with the right room you do not have any road noise. For the "Road Warrior " who is looking for a nice predictable stop it is great. Very nice Desk personnel . This was our second stay at this Best Western in Caldwell. I would highly recommend this hotel. It is very pet and family friendly, clean, quiet and very friendly personnel. For us it is in a good location to visit family. We had our grandchildren visit us and use the pool and have pizza on the patio. We will stay at this hotel when we come back to Idaho. Best Western in Caldwell, ID has some of the friendliest hotel staff I have ever met. The rooms are very clean. Everything functions. This is first hotel in a long time where the pool and hot tubs were working properly and in excellent condition. The staff makes it feel like a 5 star hotel! They really seem to care about your comfort and are extremely helpful if you need info about your surroundings. We will definitely stay again! "Go To Motel in Caldwell"
Clean, comfortable. Friendly and accommodating staff. Substantial breakfast and cookies and coffee all day. Have stayed here three or four times each year for the last 5years or so and it's our home away from home when we go fishing in Eastern Oregon. "Always Believe Your First Impression"
When we drove up to this hotel, we were lucky to find a handicap parking place right by the door. Unfortunately, right by that door was a garbage can full to overflowing and probably hadn't been emptied in a long time. Although the beds were comfortable what is it with all hotels giving you lumpy pillows? The towel I used after my shower was grey and hadn't seen a bleach bottle in a long time compared to the other towels in the bathroom. The second towel I used had a big tear in the side. The cover on the A/C was broken and if you offer a TV lineup, please make sure it matches what you offer. This was a Best Western Plus but there was no plus about it. Very pleasant stay after a long day of traveling. Front desk clerk was very helpful and friendly. Hotel clean, attractive and easy to find. Room was quiet, comfortable and met our needs. Pillows were hard, but that is a personal choice. Not much in the area for good eating--very disappointed in the home style restrurant at the truck stop next door that was recommended. I was greeted by a very Cheerful young lady who explained how they operated Their property. 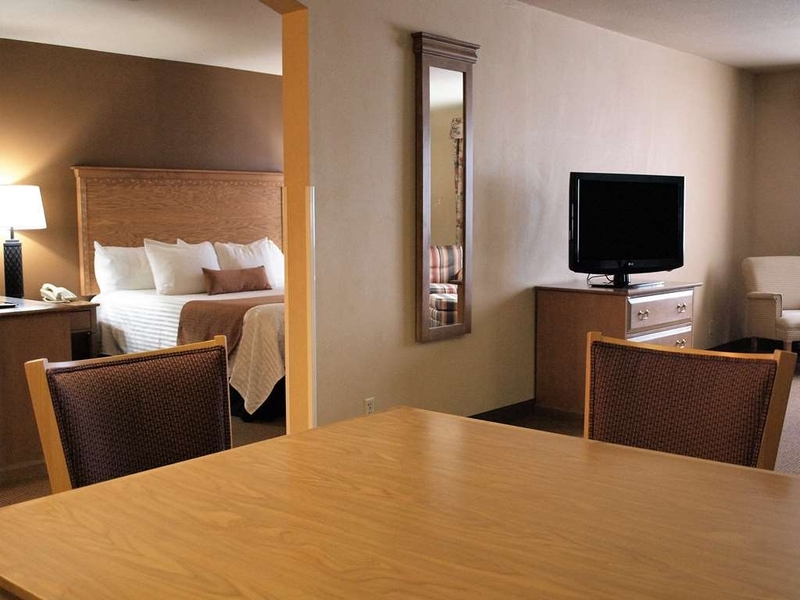 The room was large with a very comfortable bed, good sitting area, and nice Television. Bathroom was good size and shower was great. Breakfast was good providing what I needed to eat but there were many more choices available. Wonderful polite and professional staff. The hotel is well appointed (inside and out) the rooms are comfortable and clean. The value is also very good. If you are staying in Caldwell, this is your place. A great family or business lodging, try it you'll see. 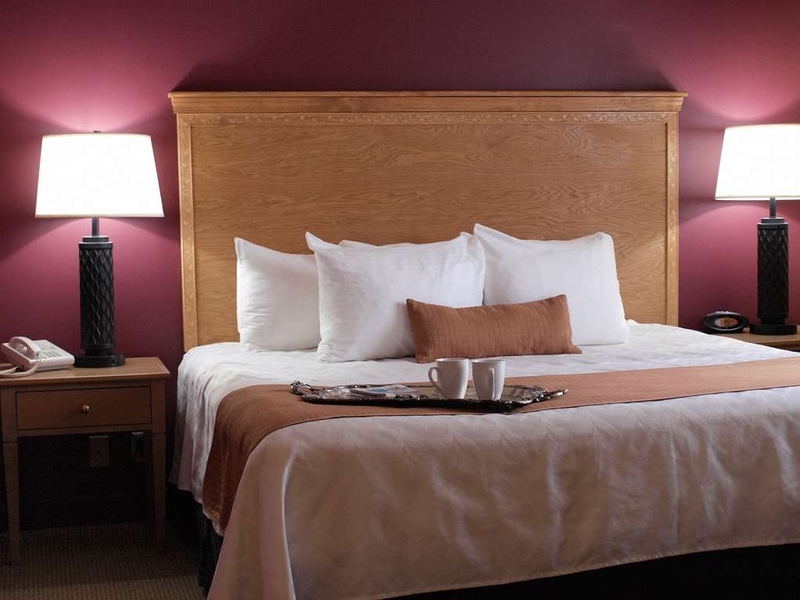 Very comfortable rooms--large, nice sitting area, comfy bed, delicious Kuerig coffee in room. The breakfast was very good with hot items, many choices, good quality. The employees were exceptionally friendly and polite. Exceeded our expectations. My wife and I have stayed there over a dozen times in the past year. The rooms are clean and well kept. The people are always there to help. The breakfast has eggs, sausage, fruit, cereal , waffles, coffee etc. Not to bad. My only complaint as with most hotels is the heating/cooling system in the way it goes off and on all night is noisy. "Thsi is the only place we stay"
Traveling to our property in Central Idaho for 5 years we needed a hotel to break up the long drive. The Caldwell Best Western has been our only stop for those years. 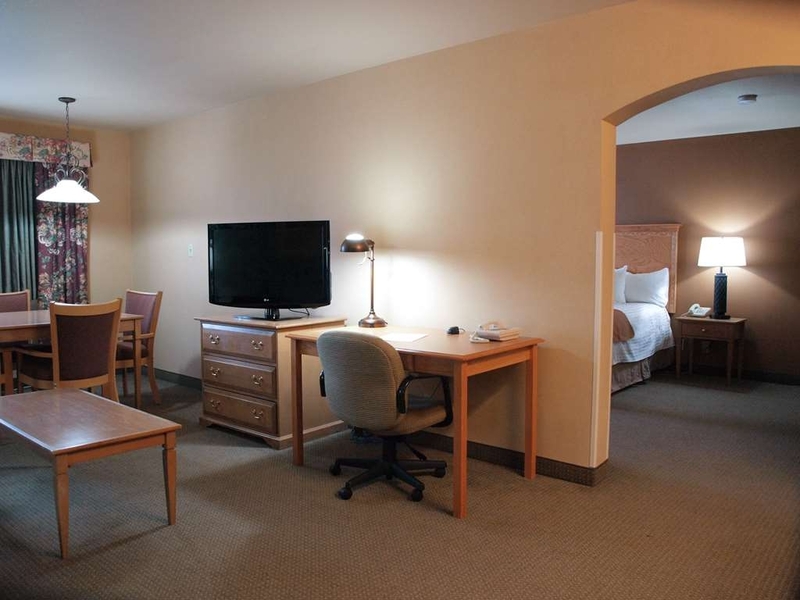 The staff is caring, the Hotel is clean, and the suites are spacious and comfortable. I don't see a reason to change since this hotel is high quality and high value. It is great to hear that you have been staying with us for 5 years. Thank you so much for your loyalty. I am glad to hear that we have shown you excellent service for those years, we do strive to treat our guests, as guests. Thank you. We stayed 2 nights here and were grateful to have a place that did not cost a fortune and was comfortable and provided what we needed. We stayed at another hotel for one night before Best Western that much more yet did not offer what the Best Western had. It may seem like small thing, but it is nice to have a small refrigerator and a microwave. Also, the breakfast was even better than the more pricey one we stayed at. 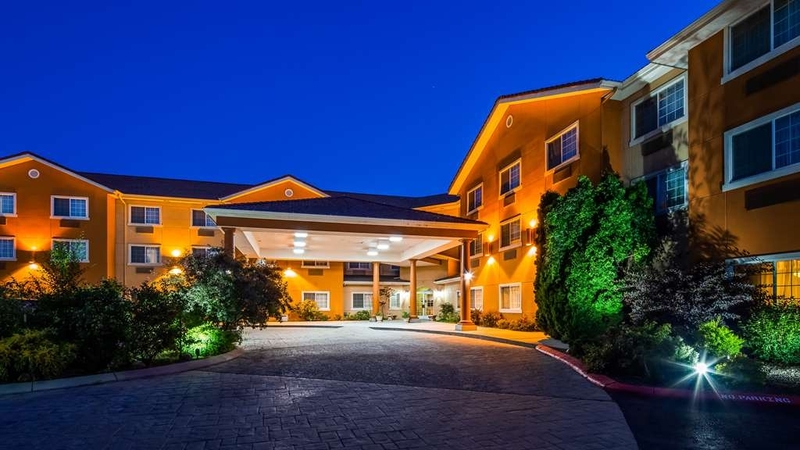 This hotel is located in a convenient spot-right off the freeway. The staff was very nice and we had no problems with anything. The only thing I noticed was the sidewalks and the front entry way needed some up keep and cleaning. We were not sleeping outside so it was not a major problem. I would recommend this over the one we stayed at the was more expensive. We would like to thank you for staying with us. We know that you have a lot of choices and we are glad that you picked us. Thank you for the nice review, and i must agree with you that the sidewalks could use a great scrubbing, we have been fighting the weather, but in Idaho we are use to that. After a long winter, we need more warm days to get everything done. We have been hitting the flower beds, pulling weeds, sweeping patios, we have washed down the sidewalks once, but that does not seem enough, so i sent out for some heavy duty cement cleaner, and we are now waiting for a nice day. it is a cold rainy windy day today, we have the fireplace on, when last week we had the a/c on. That is Idaho weather, hot one day and snowing the next. My sister and I were here for a medical treatment. We have stayed here before so we knew the quality they offer. The rooms are generous, the staff amazing, breakfast was really good. Would advise this hotel to anyone. "Great Hotel for the family or business"
They had a lot of events happening while we were there. A horse show, dog show, wedding and a church group, not to mention the families and the Southern Oregon Red Raiders Men's Lacrosse team. It was a quiet hotel and we were between the pool and lobby on the first floor. We weren't there a whole lot but it was CLEAN and smelled good and the breakfast was awesome. The pool was actually warm and the hot tub was great. I am sure the fitness center was fantastic and we looked at it but the pool was more inviting. We were there for the dog show and this was the host hotel. We all loved it. Hotel is clean, quiet and accommodating. The staff is friendly and they do a great job. We were there for a conference and the whole experience was wonderful! there are several nice places to eat in the area and the hotel had brochures telling about food services. "Comfortable, good location and price." Stayed here for one night on a road trip. Convenient location to highway. Firm but comfortable mattress, good pillows. Good breakfast selection. Reasonably prices. Evening staff were helpful, professional and friendly however on Sunday, based on staff conversations, they took newspapers for themselves so ran out of copies for guests....not good. I would stay here again. everything was fine. when only a bedside lamp was on you could see accumulated dust up the wall. cont breakfast was great. pool was nice, clean. wasn't able to get a receipt at checkout, felt it was out of convenience for the front desk staff. other than those oddities, everything was fine. Unexpectedly delightful stay...the best place ever, ALL employees were fast , friendly , helpful and very accommodating . they made our stay extremely comfortable. I would recommend this place to the President of the United States. We enjoyed our stay at Best Western. The staff was helpful, kind and cheerful. The pool was very clean and enjoyable to swim in with my daughter. The full breakfast makes this motel a great option. The room was immaculate! It is near the freeway but far enough away so that you are not disturbed by traffic noise. Nice facility, over priced, and the employee attitude seemed to us to be; we'll tolerate them." We have stayed here numerous times over the past ten years. It has been reasonably (occasionally on the low side) priced It is now over priced difficult to get a room close to parking, and, average in most other categories. The staff is always efficient and friendly. We always enjoy our stay, and choose to return to the Best Western before considering other hotels. We do run into problems if we don't book our rooms early as this hotel is immensely popular with schools, sportsmen, businessmen and those visiting family. Beautiful, clean and spacious rooms. I love the in room jacuzzi. I slept like a queen in the wonderful bed while enjoying the flat screen TV and cable. My first visit to Caldwell I stayed here. It was a great to find such a nice place to stay, that also welcomed our dogs, too. 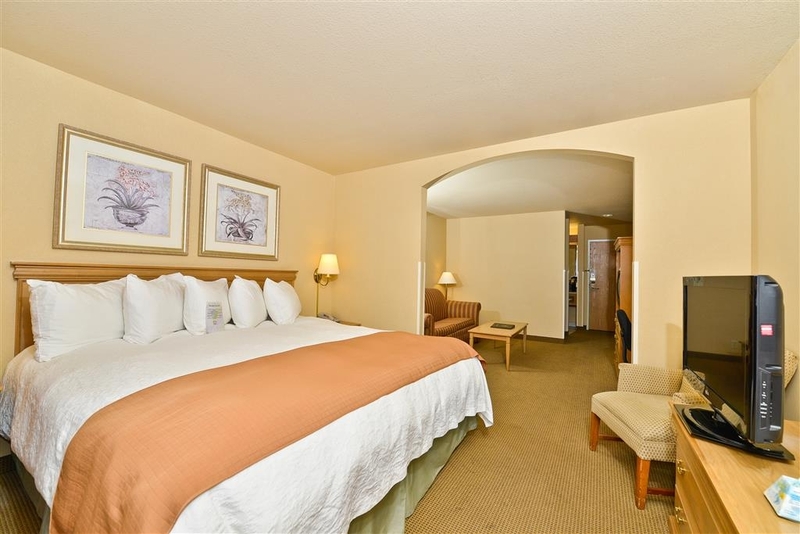 We have been staying at the Caldwell Best Western for years and have found that it offers what we need and more. It has clean comfortable appeal and the staff are friendly and professional. We come back and stay mostly for family visits and family estate business. This is a good value for my family. Spent one night at the Best Western in Caldwell, Idaho. It was clean and comfortable and seemed to be a popular hotel. Close to the College of Idaho, so we were able to easily do things with our grandson who goes to school there. Average hotel. Hotel was clean and welcoming. We checked in around dinner time. There were cookies available to the guests. 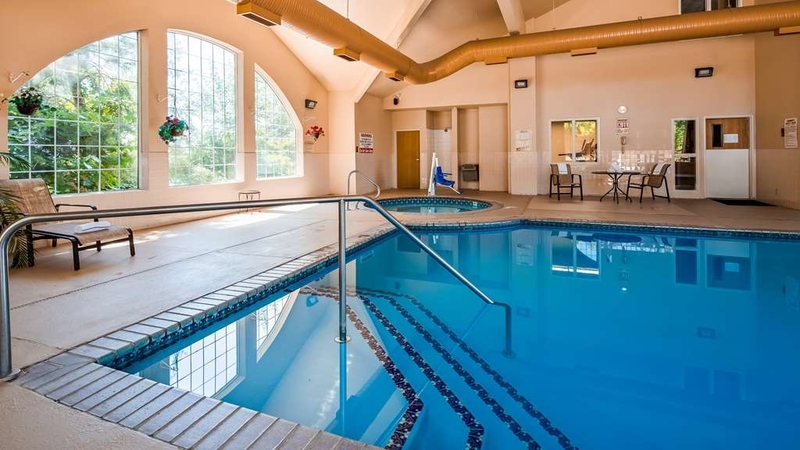 The indoor pool and hot tub were clean and well maintained. BW provides towels for the pool at the front desk. Breakfast was a standard hotel continental menu. It was open from 6am-10am. The interior building materials were not the highest quality. Some areas felt like BW went with the lowest contract bid during construction. The floors in the hallway creaked when walking. Especially in front of the elevator. It felt like you were standing on plywood with carpet on top. It wasn't a deal breaker, just noticeable. When we walked in one of our associates stated he was home!!! our entire crew loves this place!!! We bbq one night!!! The place is just nice!!!! We have been staying in Idaho for work since before Thanksgiving!!!! When we are in the Caldwell area we have choose this property!!! The staff is very friendly and helpful!! "More than just decent and a 24 hr pool"
24 hour pool! I will be back! Beautiful third floor, get the third floor, it had a nice view, considering it's Caldwell. The night staff was profoundly nice. We went on business and pleasure combined. One block off the interstate but very quiet, rooms are spacious and clean. Burger King adjacent to the parking lot. Here for three days, the staff was very courteous and were genuinely concerned that we were satisfied with our stay. I would return to this hotel. 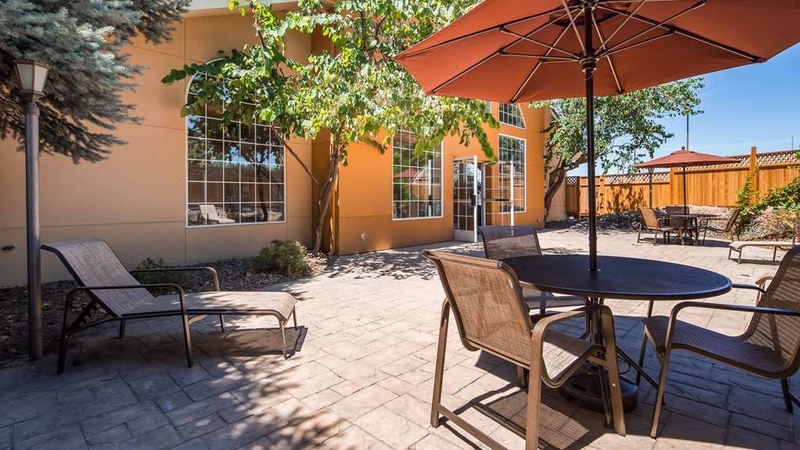 "Nice place to stay in Caldwell"
Clean, neat, pleasant and spacious and you can enjoy beer or wine for purchase in the lobby (package, not a lounge)-wifi available and adequate, close to restaurant chains, shopping, etc. I recommend it as a great, affordable choice in Caldwell, Idaho. BEAUTIFUL inside and out!!!!!!! The rooms are VERY large! The colors from beds to the walls are beautiful and relaxing! The gas fireplaces to furniture to hot tubs and exercise room cant be beat! One of the nicest places I have stayed for the value!!!! Traveling through the area my wife and I found this place late one night. The desk clerk was very helpful in getting us a room quickly so we could lay our weary heads on a clean and comfortable pillow. 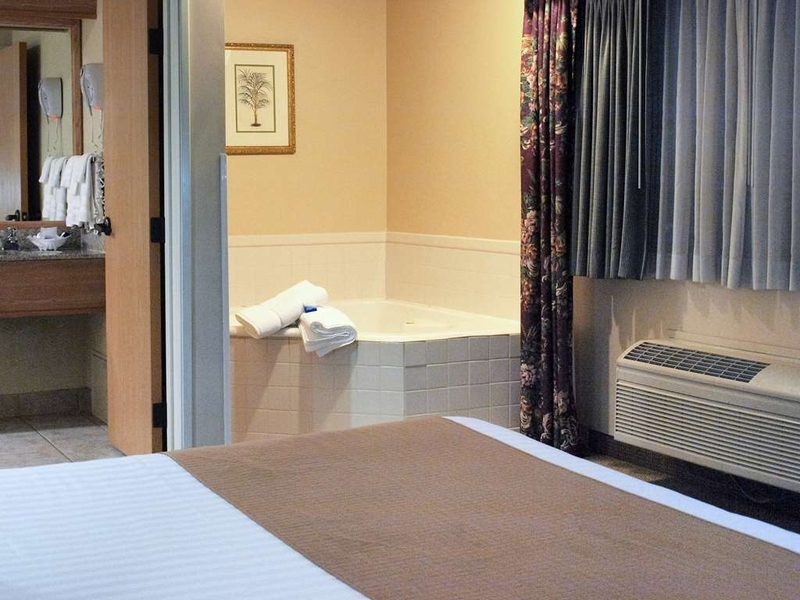 The room was standard fare for budget hotel that is located near an interstate. No extra frills, but at nearly midnight it was exactly what we were looking for on short notice. Having arrived late, we did not get up in time for the complimentary breakfast. The hotel was clean throughout the lobby, hallways, and our room. Despite being near a freeway, we had a quiet and peaceful slumber. When ever I or anyone from my company is making a trip to Eastern Idaho, we always try to get a room at this Best Western. I have made it a point to stay here for personal travel as well. Never disappointed. We enjoyed our stay at this motel. It was very clean, the staff was friendly and accommodating. The breakfast in the morning was very good. There was a huge selection of items and they had a staff member tending to the buffet and keeping food replenished and the area clean. The desk staff was helpful. We will stay at this motel in the future should we need a room in this area. Driving my daughter to college left home late in day so did not arrive at property until 12:30 am but was greeted warmly by the desk clerk at this time of hour. Was expecting more of a tired half zombie like person. Very impressed with helpfulness of employee and warmth of hotel when it was close to zero degrees outside. Convenient for the highway, great reception in checking in. Rooms Ok not the , greatest, its a Best Western after all. Breakfast was the standard fare. but I had a good nights sleep on a very comfy bed. Will stop here on my way home again. My husband has been working out of town since prior to Thanksgiving. So whenever I can I go join him. He stayed at this property when working in Nampa and liked it. The staff and the rooms are great. The full breakfast made his life simple!!!! We have used the BBQ to make our dinner so we could stay in. The patio where the BBQ is, is very nice. We will probably come back when it is just pleasure!!!! We always stay here when we are in town. We can always count on great service. Rooms are always clean and beds are comfortable. Wifi works great. Breakfast good for a hotel. Great location off of the freeway and close to the college. I have absolutely nothing to complain about. This hotel was everything we could ask for and very reasonably priced for our family group of eight (in three rooms). Great staff (very helpful), great facility (did not have that hotel smell), very nice rooms (very clean), the complimentary breakfast had a good selection/options, and the cookies late afternoon/early evening was a nice touch too. Its conveniently located---Walmart was nearby when I needed a prescription, plenty of restaurants around so every one was happy, and freeway access was close, but not too close. We will definitely be staying here again when visiting family in town. Everything was excellent. The breakfast was exceptional!! The staff was very helpful and we enjoyed it all. The room was very clean and smelled fresh!! I would highly recommend this Best Western motel to everyone! Very quiet sleep. Everyone was so nice to all of us. It was a big family gathering so many rooms. Pool was warm and great to get into. Great breakfast to get you ready in the morning, and they have items they can make just for you. It is always a great stay here, Lynda and the staff are always pleasant and helpful. If we ever have any issue's we just tell them and it gets taken care of. Breakfast is the usual scrambled eggs, sausage, potato's. Not to bad, nice and filling. NOT up to Best Western Plus standards. The hallways are filthy and smelly of dirty dog. The supposed pillow top bed was uncomfortably hard. The pillows overstuffed so you could not lay your head on them (good thing I brought my own). Just not a well ran hotel. I would like to thank you for taking the time to write a review, we do look at each and every review to see where we can improve. We are a pet friendly hotel, i believe that some people just do not like the dogs being allowed in the hotel, to other people the dogs are part of the family and love being able to travel with the whole family. I can assure you that we shampoo our hallways and rooms all on a regular basis, there is barely a day that we aren't shampooing. Any room that a dog stays in is thoroughly cleaned, with a special cleaning check list. The hallways and public areas i usually hire a professional service with more powerful machines, they were just here. We like the hotel to be just as clean for the families traveling with pets as for people traveling without pets. We are sorry that you did not feel comfortable with us. Awesome staff, great breakfast, rooms and bed very good. We have stayed her three time and would not consider staying and place else. Friendly, very helpful staff. Quiet location easy to get to off highway. Thank you for staying with us, multiple times. We are glad that you like us enough to keep coming back. that means a lot to us. we do read and study all the reviews to see where we can improve. Have a happy holiday season and hope to see you back again soon. I have stayed many times at the Caldwell Best Western over the years for family and business visits. I have always been treated very well by an excellently trained and friendly staff. This is a great family and business lodging destination. I highly recommend this Hotel for your next stay in Canyon County, Idaho. While this property is pretty much like any other Best Western, the customer service was anything but average. The staff went out of their way to make us comfortable and feel welcomed. The complimentary continental breakfast was better than you usually get at hotels, and the dining and kitchen area were very clean. 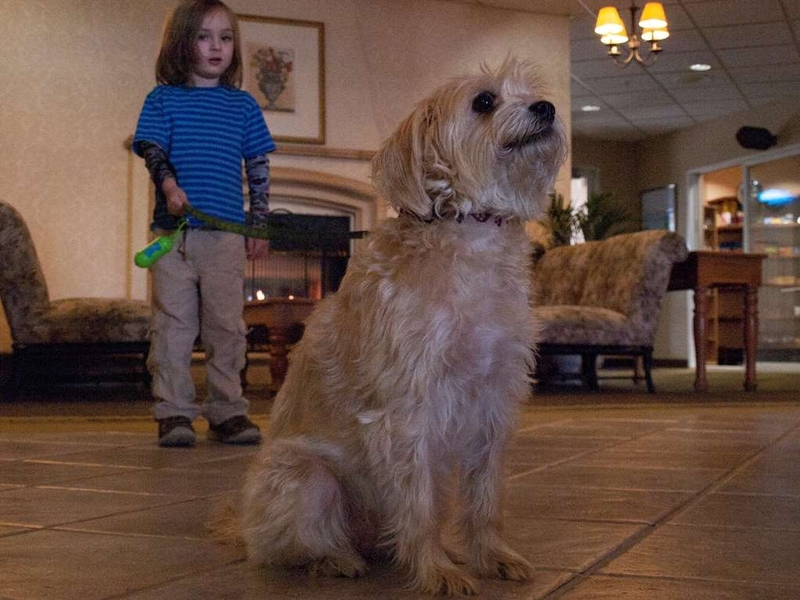 We had a fantastic stay at this pet friendly hotel. From the warm welcome at check-in to the great breakfast options to the smooth check out. (I highly recommend the sweet rolls!). We will be staying here whenever we are in town to visit our family in Caldwell. Highly recommended. This is not the first time I have stayed at the Best Western Inn and Suites in Caldwell. The staff here is friendly and the rooms are clean. Their beds are so comfortable! They have a fabulous breakfast selection! I will definitely be back the next time my friends and I want to go dancing! Overall experience was very good. The location was very helpful for the work we had to do in Caldwell. A very helpful, friendly staff, plus a great breakfast. Computer and access was good. Staff really took an extra effort to make sure our stay was good. "Very good but the sofa bed was horrible"
We stayed in a suite with our in-laws and gave them the bed while my husband and I took the sofa bed. So basically we had no sleep for 2 nights as it was like sleeping on a chain link fence with a towel over it. As we were in town to visit family and only slept in the room and ate the great breakfast, it was well worth the price. I'm in Caldwell on business on a regular basis. This hotel is a constant on service and quality. The staff are always welcoming and professional. It is always clean and the beds extremely comfortable! "Great place to relax on the road"
We stay at Best Westerns. When we travel to our Idaho property we have plenty of choice were to stay. The Caldwell B/W is by far the best we have seen. it is easy on/off the highway, clean, comfortable and economically priced. Lynda the PM Desk Manager is the friendliest hotel person we have seen in some time. we stay there so much it is almost like taking to family. If you stop in take the time to speak with her she is a welcome sight after a long day of traveling. We have stayed here on previous road trips to the southwest and were pleased with our experience once again. The property is well maintained and staff is very pleasant. Definitely will continue to remember this Best Western on our trips through Southern Idaho. 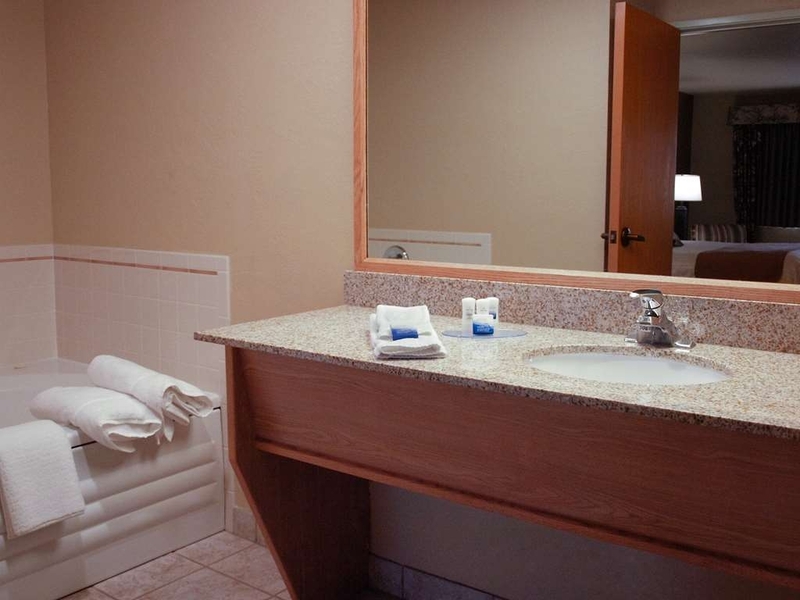 Rooms are very comfortable and quiet even though close to the Interstate. Good breakfast and awesome coffee freshly brewed always available. Great room layout. Very comfortable and clean. Staff very friendly and helpful. One of the nicest Best Western Plus that we have stayed in. Highly recommend it. The price was very competitive and great value for price. "Stop at Caldwell for a great experience!" Unbelieveable, friendly staff, amazing breakfast, room, greeting and pool and hot tub......perfect temperatures.........a real oasis, could stay there a couple of days and enjoy the retreat!!! Plus they sell wine and beer should you wish some. It is immaculately clean. Usually we stay in Ontario, ID, but decided to push it a bit further, and glad we did. Very happy will now plan to stay there enroute to California! Went to Caldwell, ID for business. This Best Western was very nice and the people were great! Rooms were very nice and the hotel itself was very close to everything. 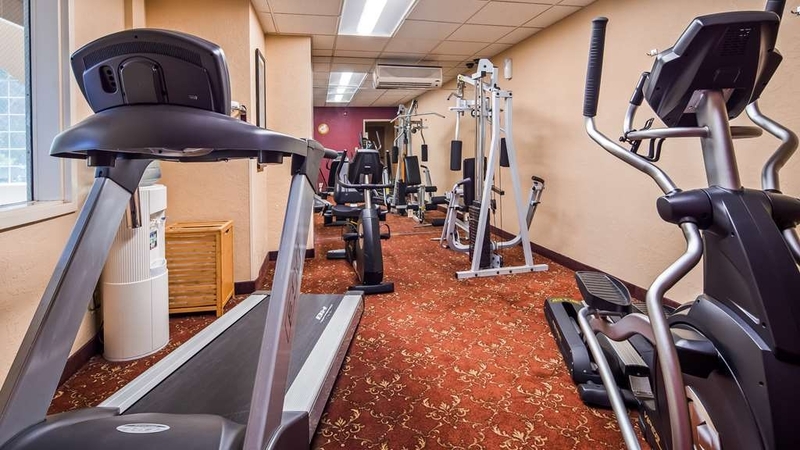 Amenities included fitness center, pool and complimentary breakfast. This is a place that we will return to in the future. Friendly, clean and a great staff. They all made you feel right at home. Went to Caldwell to pick up a 14ft trailer and was worried about parking at the motel. I found that they had ample parking and were very helpful on the best place to park. We alway stay here when we are in Caldwell. The front desk manager is very helpful and friendly. She goes above and beyond to make the stay the best it could be-thank you! We like that they offer local wines as well. The seating area in the lobby has always been one of the most inviting of any motel we've stayed at. The rooms are clean and comfortable. My husband and I enjoyed our stay at this hotel. The hotel was very full of high school soccer players but you would never know it! The hotel was clean, the service was excellent. Breakfast was very good and kept well stocked especially given the amount of high school kids that were there. We would definitely stay here again. Having stayed in many Best Western motels, this one was missing the plus. Grounds over run, and needs paint. Wild cats being fed on back patio area. Near stock yards, flies and smell goes with the cattle. On the plus side, good bed, quite, great sweetrolls. 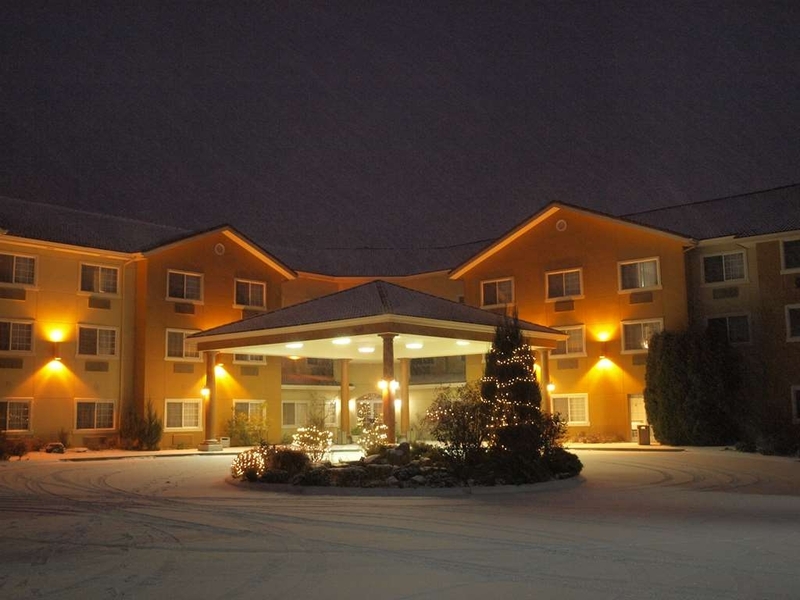 "BEST WESTERN INN AND SUITES CALDWELL"
Great hotel, great breakfast, nice pool and hot tub. Very Friendly and helpful staff. Close to Caldwell, the College of Idaho and Simplot Stadium. Great amenities. One of the nicer Best westerns I have ever stayed in. We stayed one night at the Best Western in Caldwell, Idaho, Saturday, October 3rd, 2015. We booked our room online and requested an early check-in time but were told they could not guarantee an early check in until our arrival. Upon arrival, we were given an upgrade in our room from a queen, to a king suite because "Expedia had overbooked the queen rooms". I've never really understood overbooking...it just doesn't make sense to me...it's gambling and I can't relate to that either. However, far be it for me to complain about an upgrade. Our king suite cost us just at $100 (with taxes and fees and such). Given that we had an upgrade from queen room to king suite, it's sort of hard to not feel like we got good value for our money. The room was clean, the bed reasonably comfortable. The room had two televisions...one across from the bed and the other across from the couch (which was super saggy). 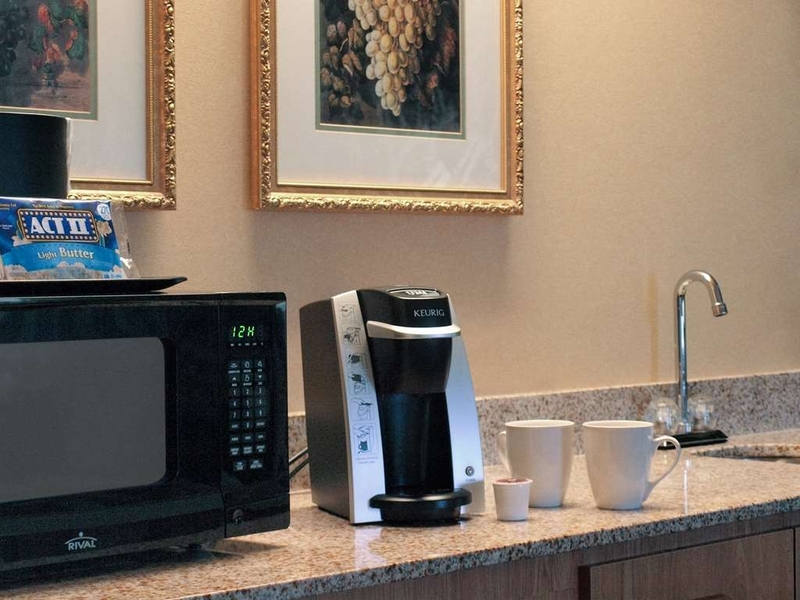 The room had coffee maker, microwave and fridge and even provided a packet of microwave popcorn. The room was fairly quiet as were the grounds. Most guests were reasonably quiet...and we had our window open to the parking lot. On the front side of the building, you are right at a fast food drive in area but it didn't bother us. We didn't notice much sound transfer between rooms or from the hall. The shower had an unholy squall. I very high pitch that made you want to shower fast and get the heck out. The complimentary breakfast was more than adequate. It says "bacon" on the website, but they only had sausage the morning of our stay...which is not our fave...we wanted bacon. There are a few things that a person on duty will make to order...like pancakes or french toast. I really appreciate complimentary full breakfasts. It saves time and money over going out. The protein that comes with a full breakfast makes it much more desirable than a continental breakfast. I don't like all carb breakfasts. Oh, and hubby said to mention that they had "real towels", which were thick (not threadbare) and large enough (vs barely above hand-towel size). The seemed to be reasonably new. Staff was friendly and we had no problems with our stay. We would certainly try this place again if in the area. It was a great place to stay. The staff was very helpful and nice. The room was great, on the ground floor as we wanted. We are senior ladies and find it hard to manage our luggage very far. The breakfast was hot, good and fresh. We would stay here again if we ever get back this way. We were simply thunderstruck by the quality of this BEST WESTERN hidden in an industrial looking area. It is GORGEOUS and the beds were WONDERFUL. The staff was exceptional. They even had a great little breakfast available. We would go back in a heart beat if we didn't live so many states away. Very nice stopover. Very friendly staff. Pet friendly and room was clean and comfortable. Breakfast was good and well stocked. The parking lot was a little small, not sure if there is off site parking. This hotel was very nice and clean. The service was great and we really enjoyed the nice hot breakfast, too. The indoor pool was very big and clean and had warm water which we really liked. I would definitely stay here again. "Check in was a breeze"
We became rewards members and were able to check in early. Due to the circumstances of our trip and the fact that we had traveled all night, this was an amazing benefit for us. The desk help was accommodating and helpful in making everything happen to help improve our trip. It made an amazing difference for us! Booked here based on reviews, but WOW, do I disagree with those!!! If you stay here, they do have slightly better rooms in a "new" wing, so be sure to ask for one of those. Room I first had was old and raunchy! Nasty torn carpet, ironing board w/iron, etc. stuck on wall in bathroom right by the vanity and IT had a nasty stained cover. I went back to the front desk to ask if any of their rooms had been remodeled (since reviews had indicated a much nicer hotel!) I was told about the new rooms and switched to one of those. This one was newer, but had a much tinier bathroom. At least there was not a nasty ironing board stuck in it. Bed was even worse than the one I had the night before at a Hampton. I got maybe 3 hours of sleep and another painful day on the road from that bed at this Best Western. I'll end with a more positive note: the personnel here are cordial and very accommodating, offering to help me move my things to the newer room. Trip Adviser travelers beware of reviews....don't count on them to be accurate. 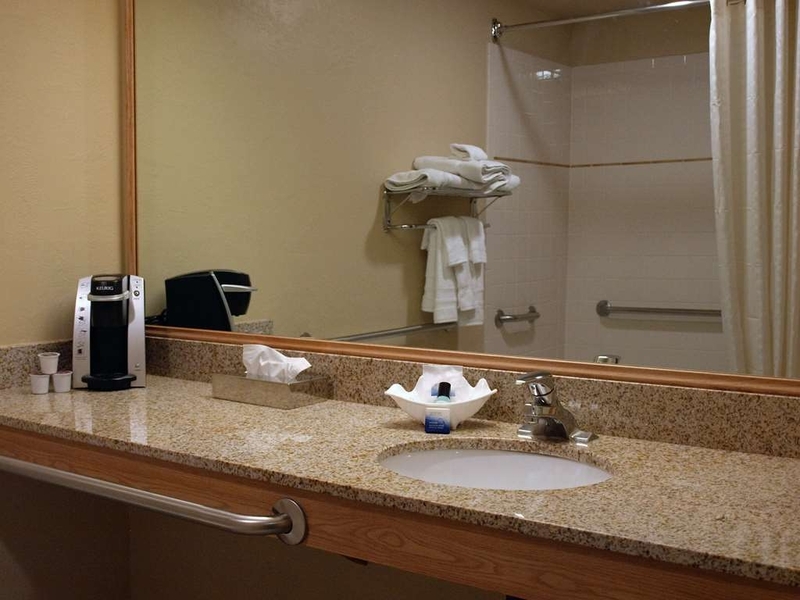 LAST: Room I had booked was the one and only handicapped room, which I badly needed, but CLEAN is important to me. Too bad they did not renovate THAT room, since there is always just ONE room for the disabled. I find the Best Western chain as a whole to be rather "iffy". broken shower curtain rod, bushes overgrown in parking lot blocking some parking, TP rough and unpleasant. No vending machines except on first floor. The location was not around much of anything except truck stop and fast food and one restraunt. "Convenient location just off freeway but far enough to be quiet. Lots of dogs." We had a very enjoyable overnight stop in a third floor room at the back with a spa. The two person spa was great and just what we needed after driving all day. The room was clean, quiet with lots of space and no ancient smoke smell. Downside was we had the window open for night air without using A/C. At 5:40 am on a Thursday morning we were on the ceiling as the garbage truck lifted, dumped and slammed down a dumpster just below our window. When we booked we were told that pets were only on the first floor which was fine with us as we book away from pets due to allergies. There were dogs of all sizes on all floors. Some humour is the hair dryer is mounted on the wall just above the towel rack with the cord hanging down into the rack.